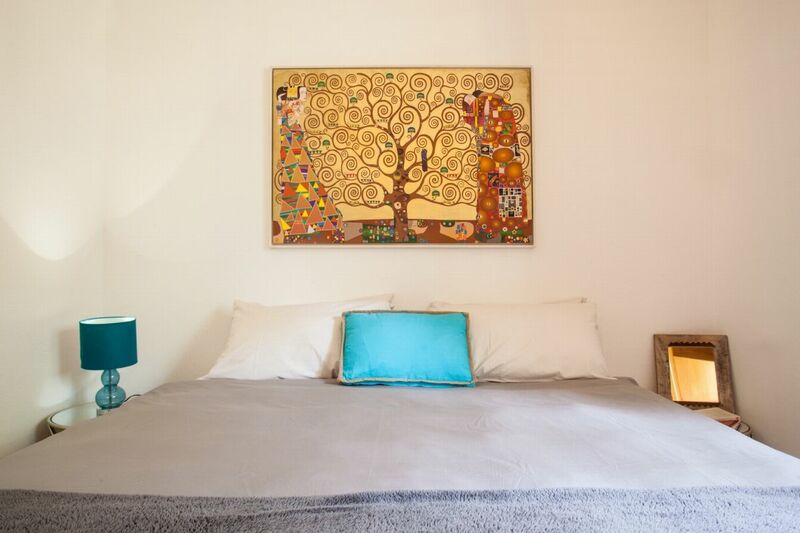 Bed linen changed once each week. 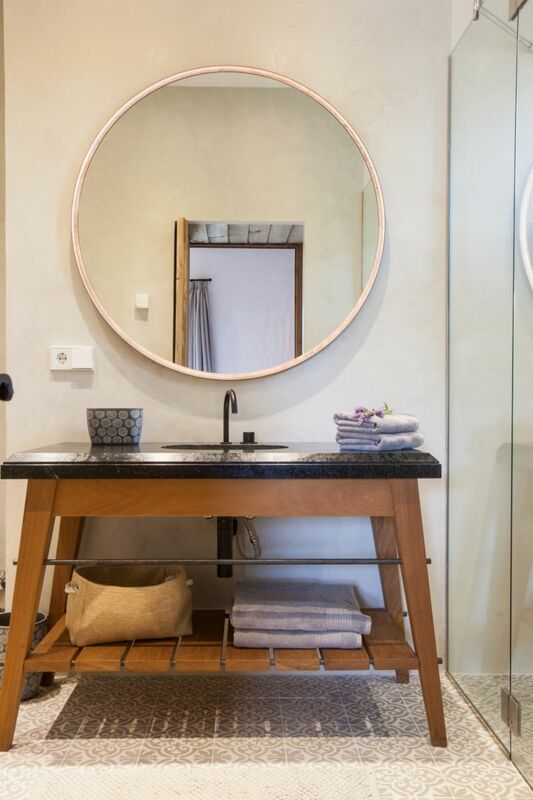 Towels changed twice each week. 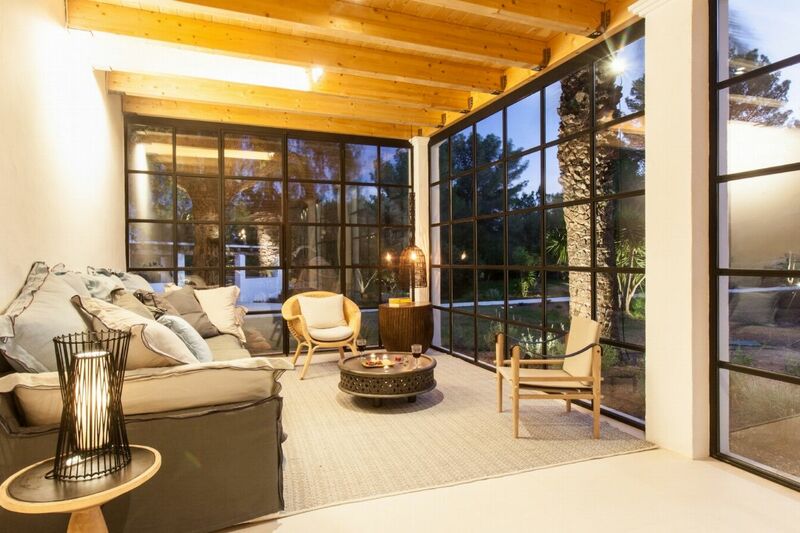 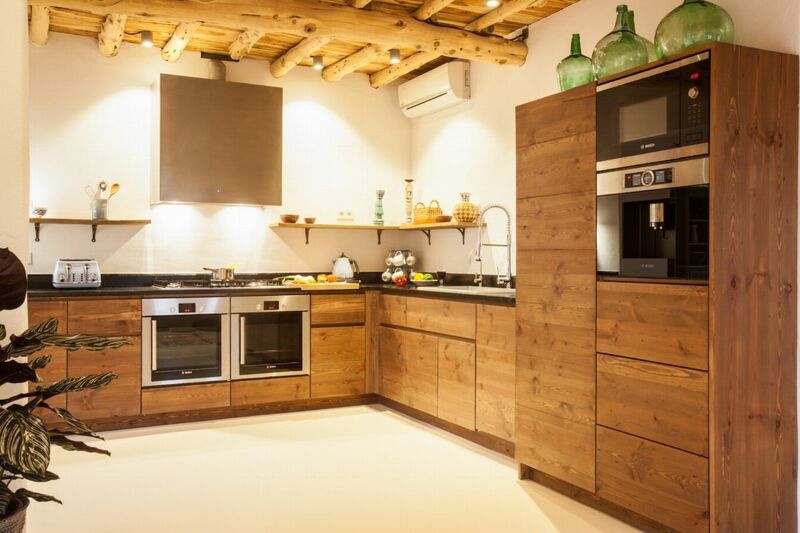 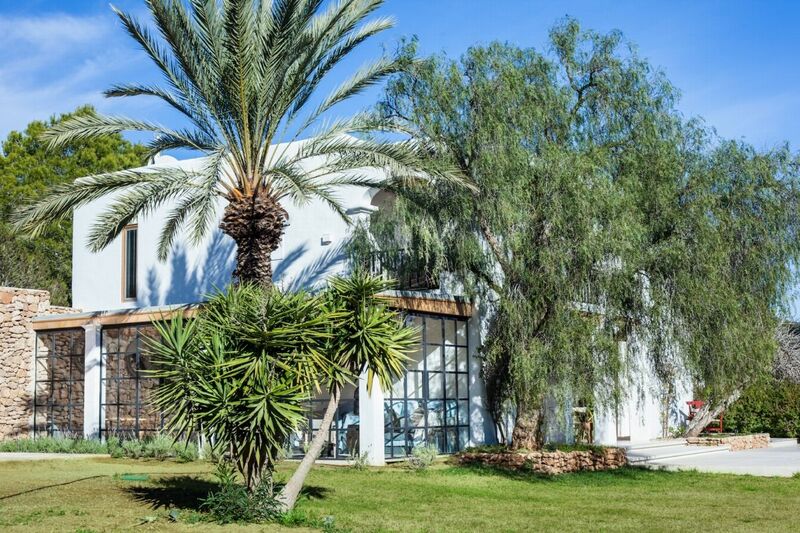 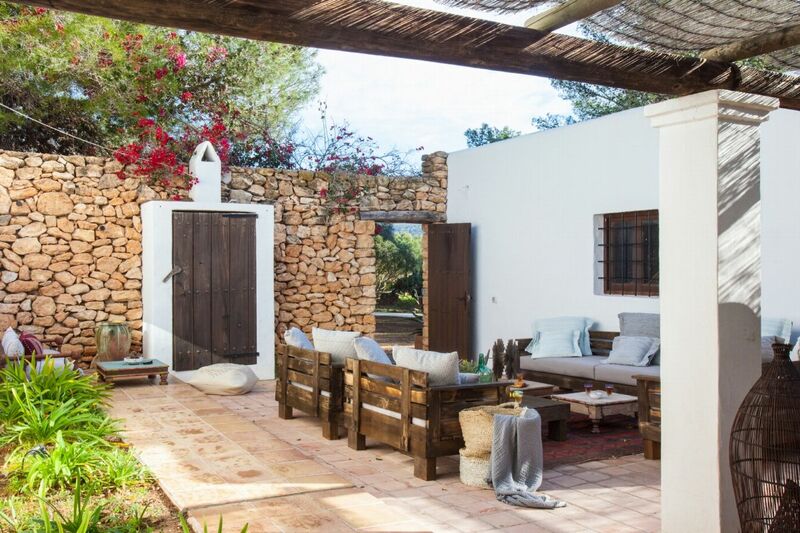 Stunning newly renovated traditional 8 bedroom finca with spacious outdoor entertainment areas and high quality finishing close to Cala Jondal. 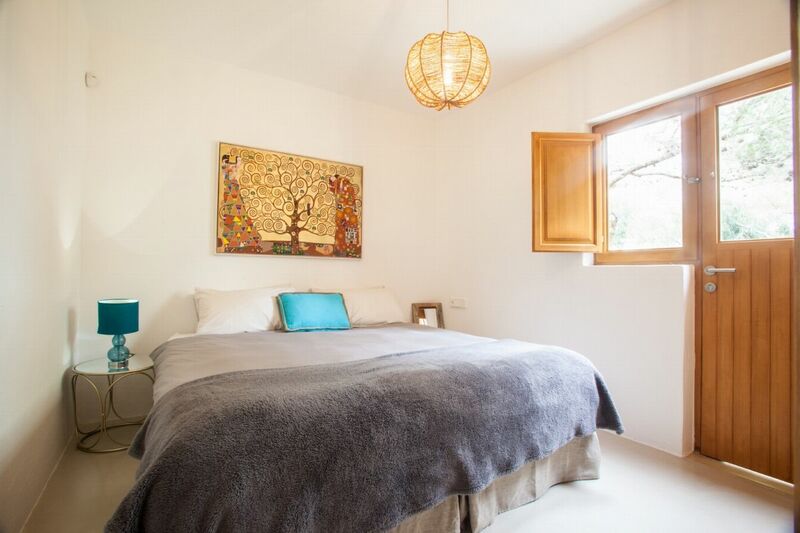 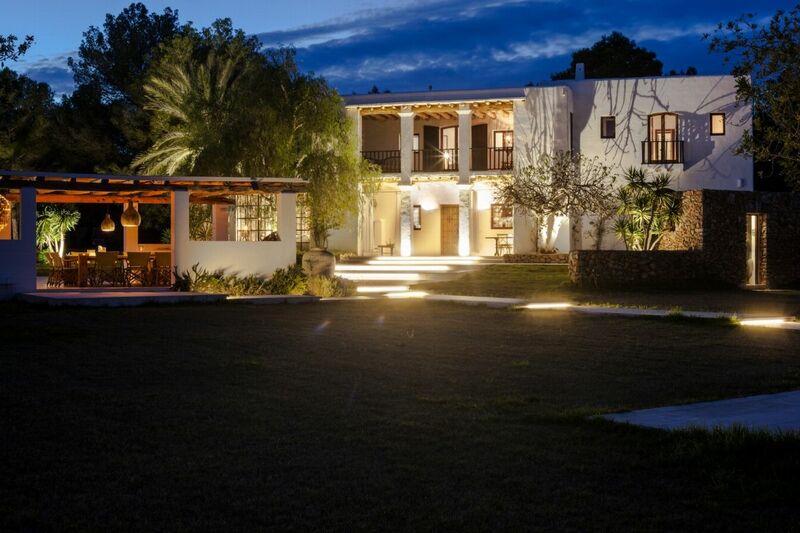 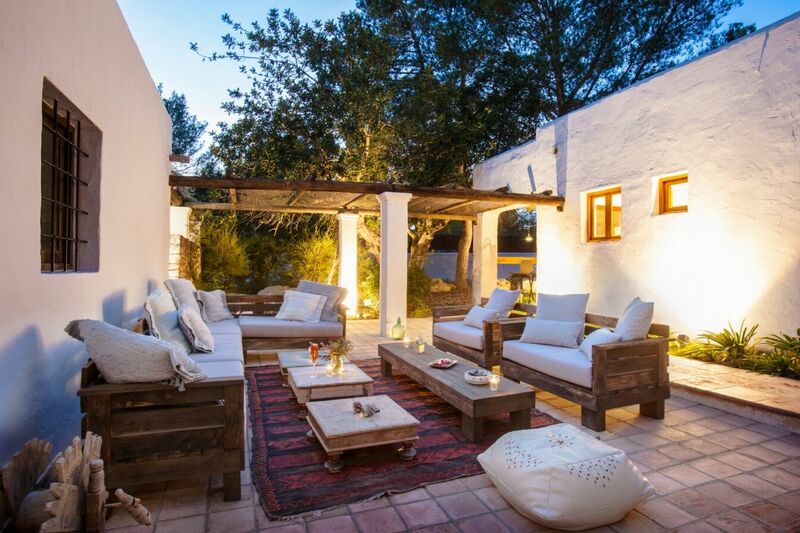 This stunning newly renovated traditional 8 bedroom finca is located in a much sought after area of San Jose, just a short drive from the village and not far from the trendy hot spot 'Blue Marlin'. 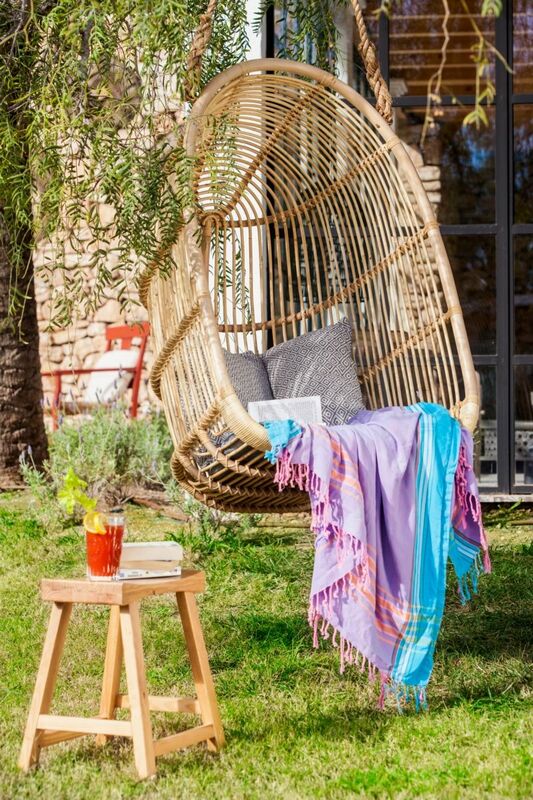 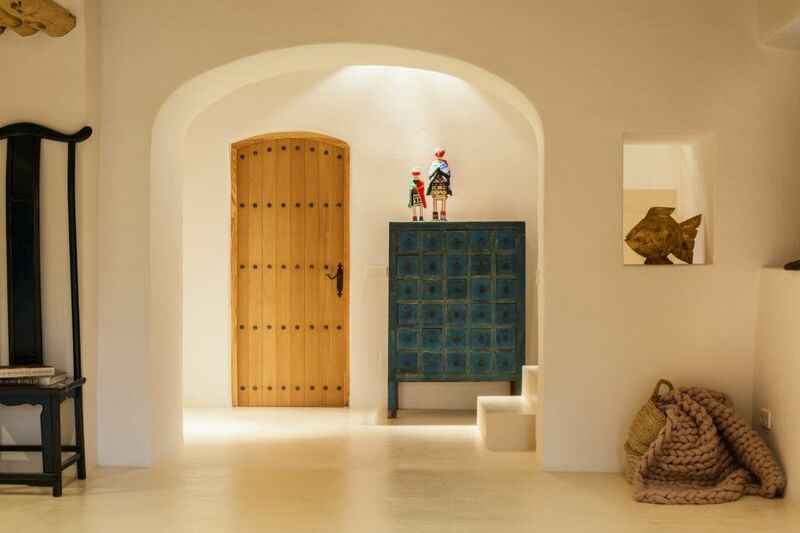 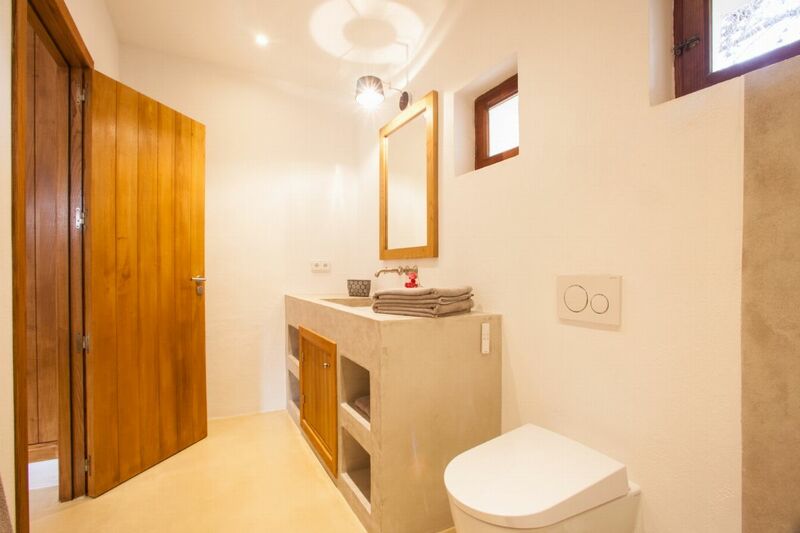 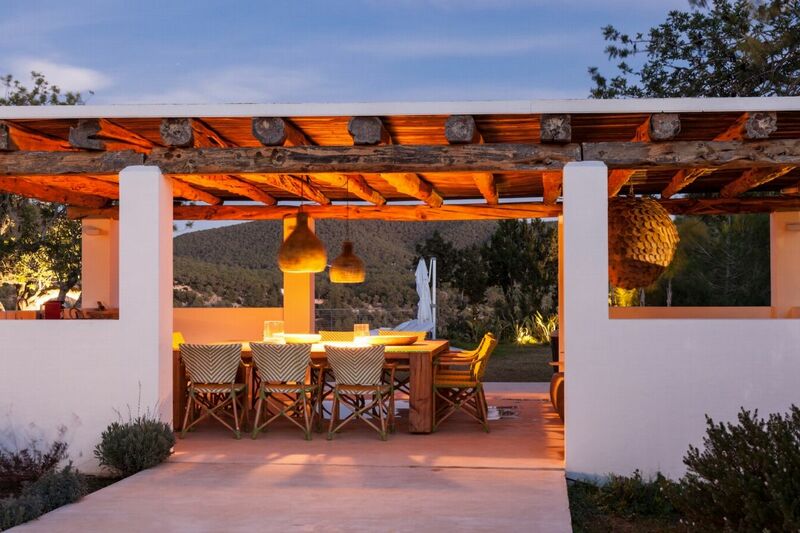 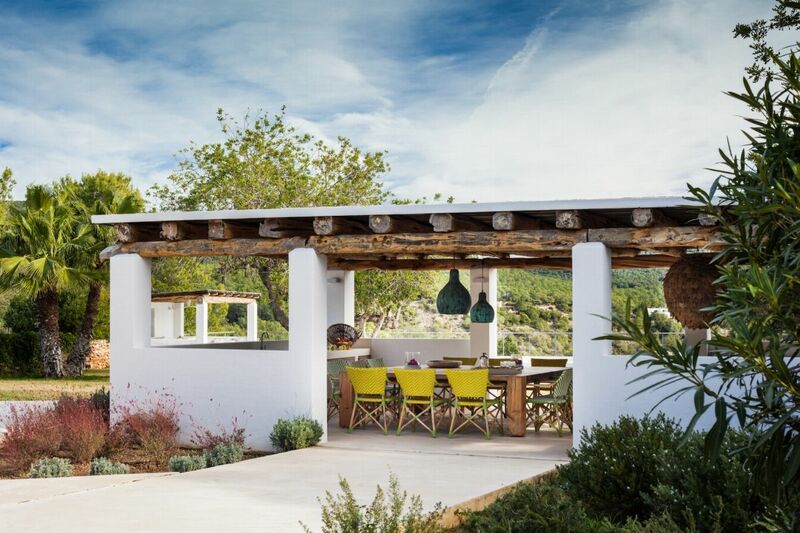 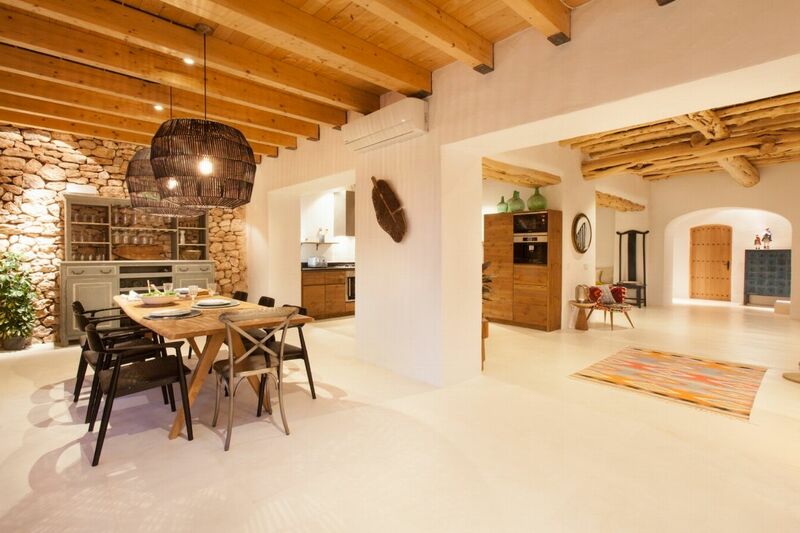 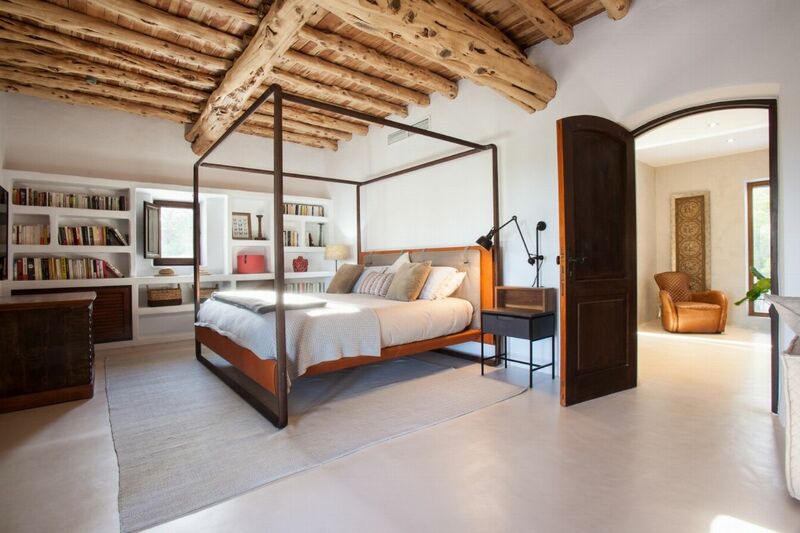 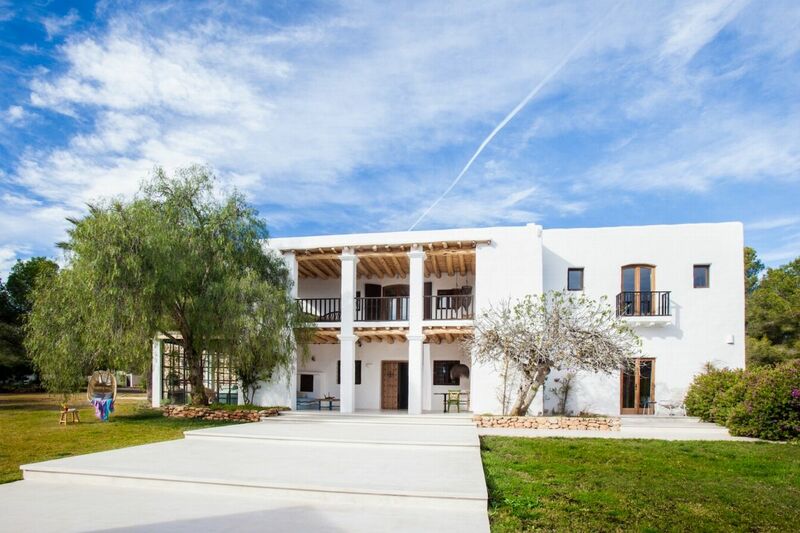 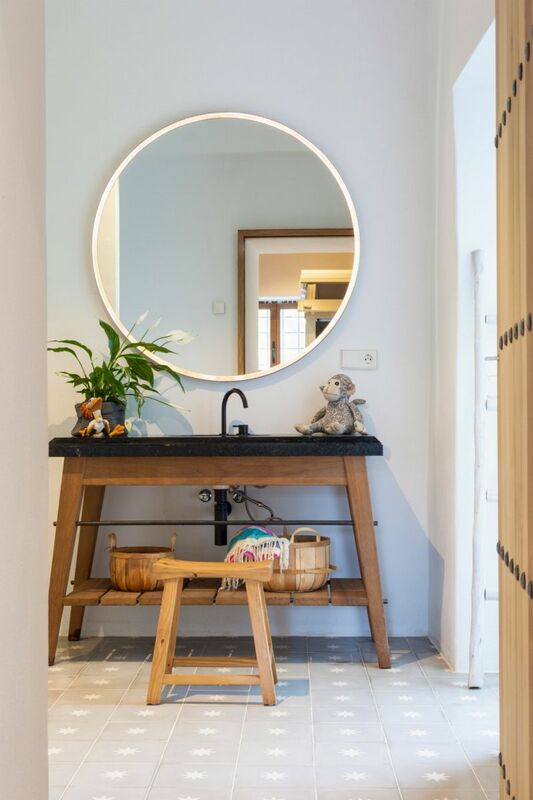 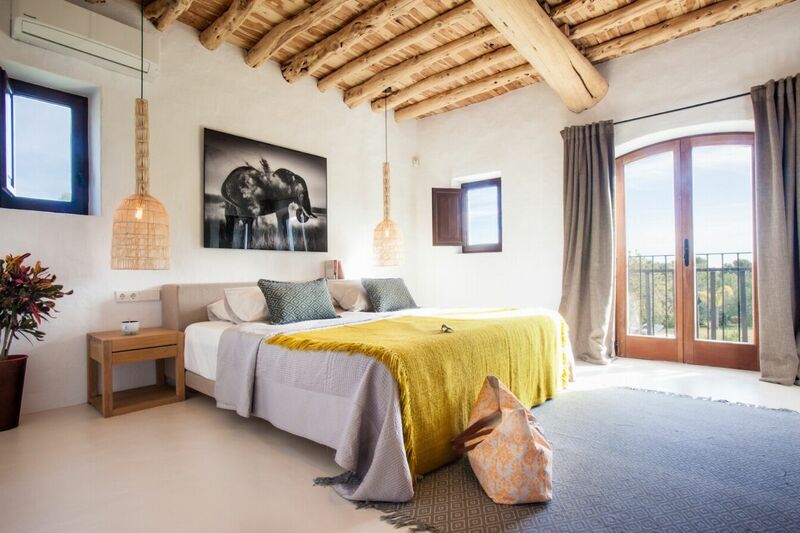 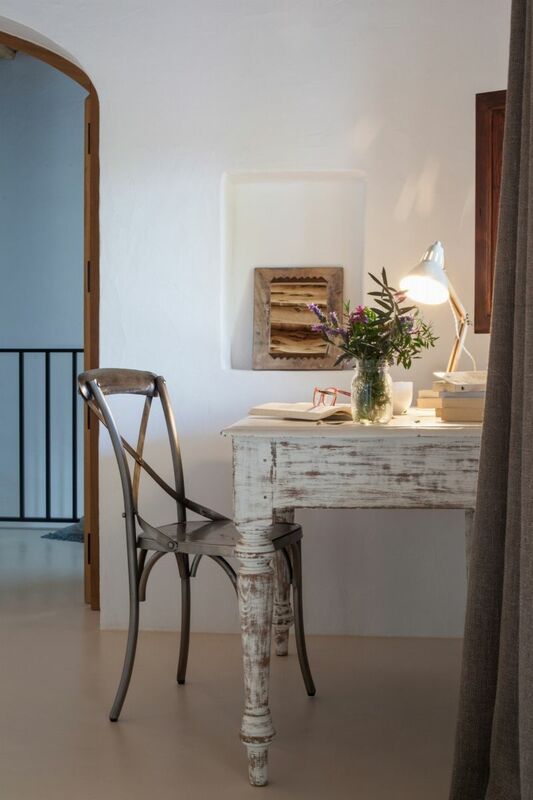 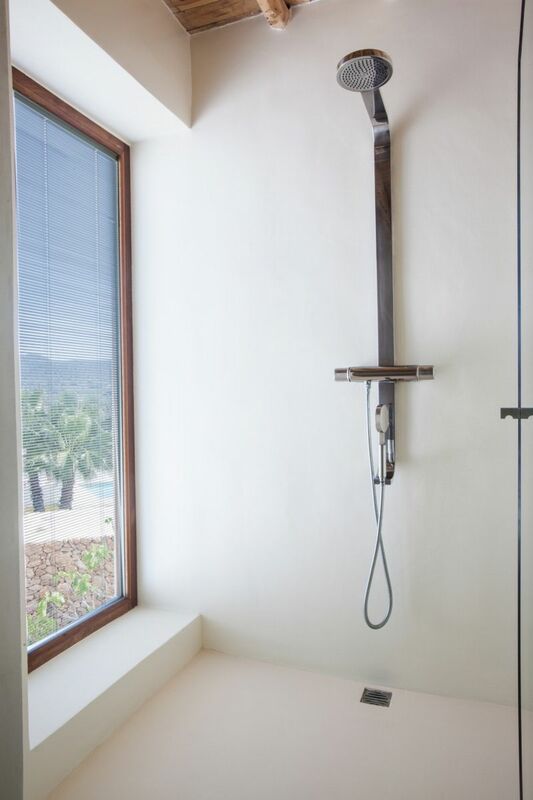 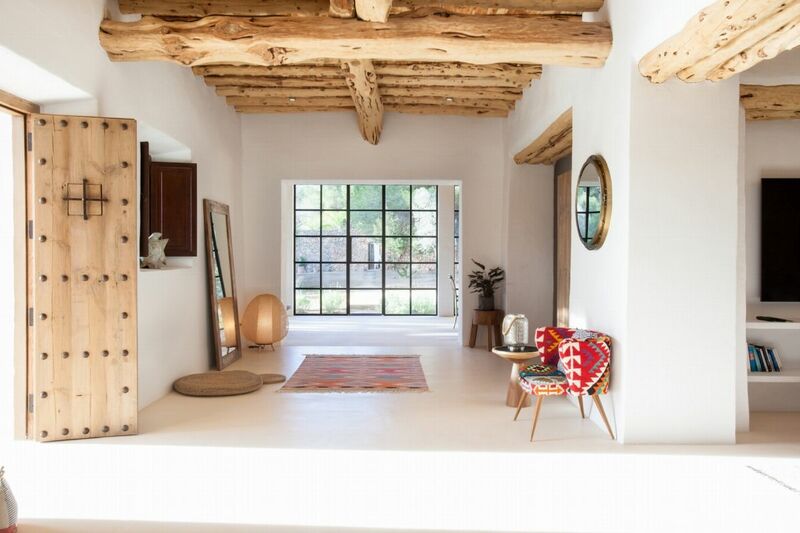 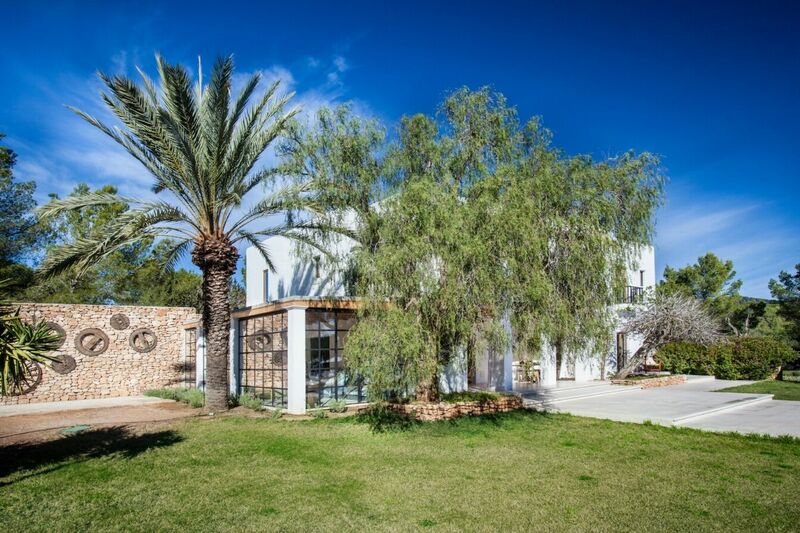 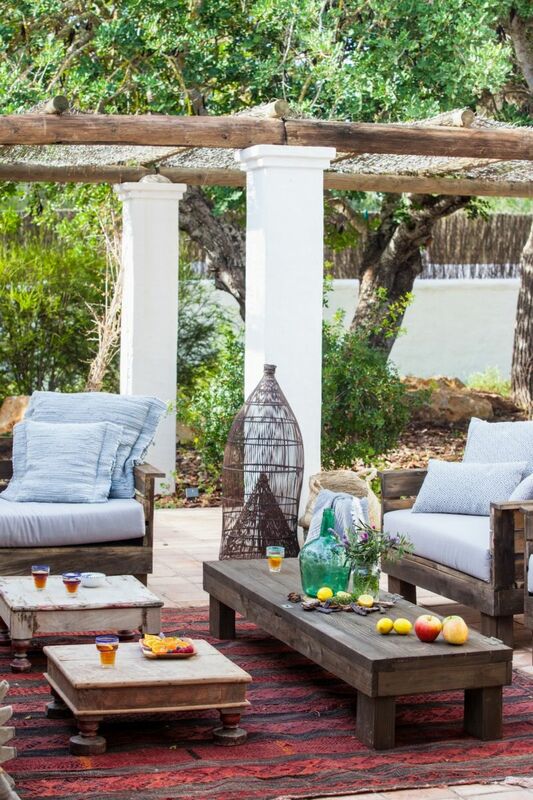 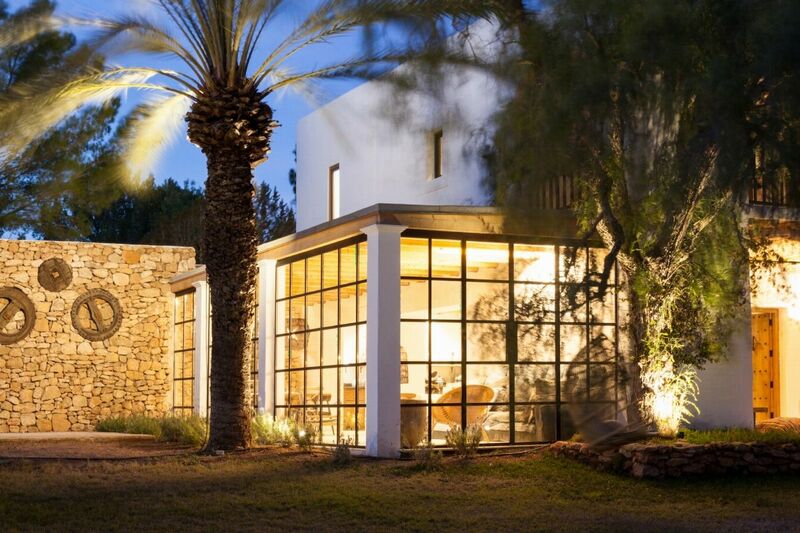 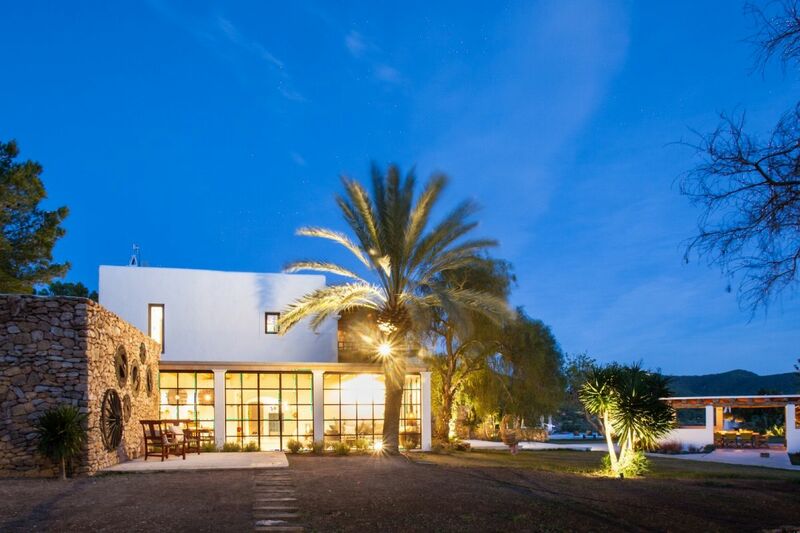 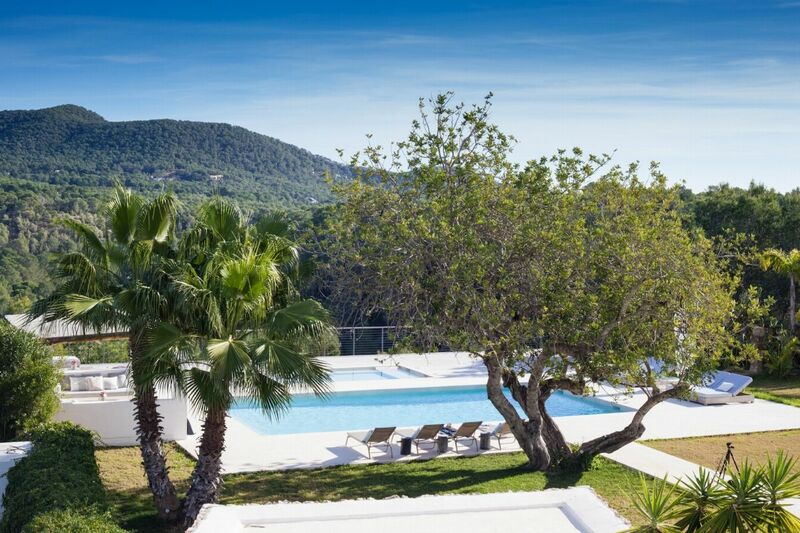 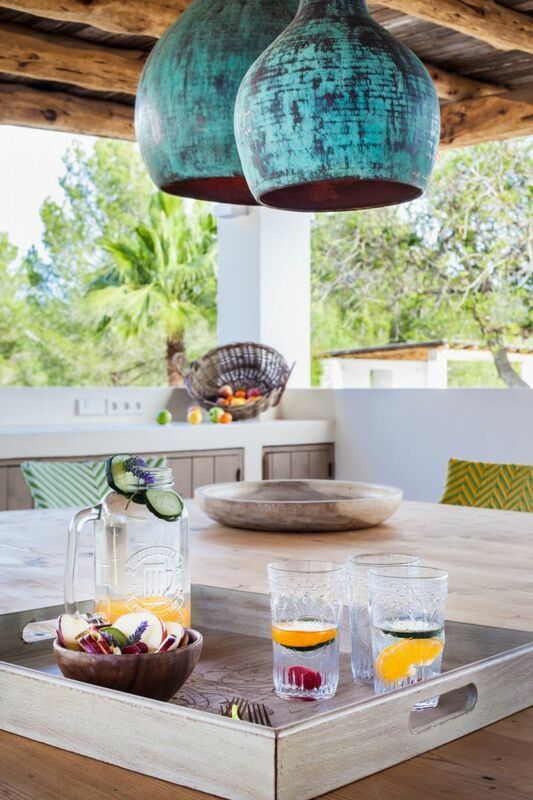 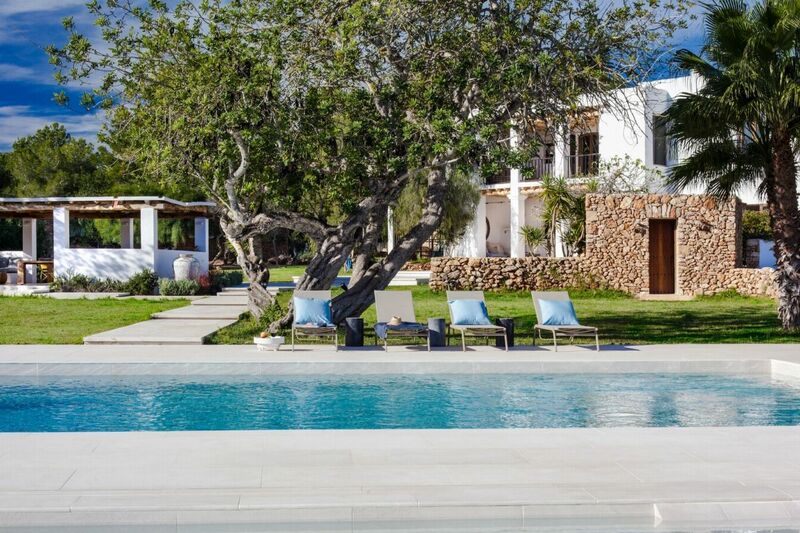 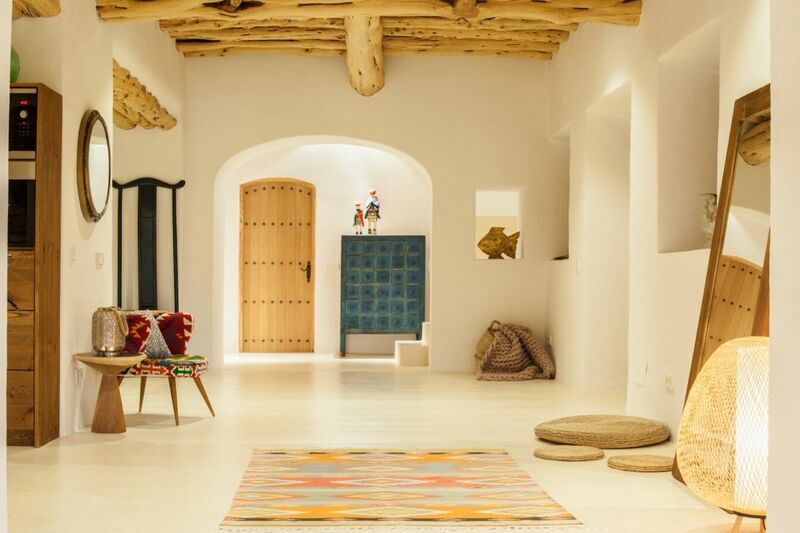 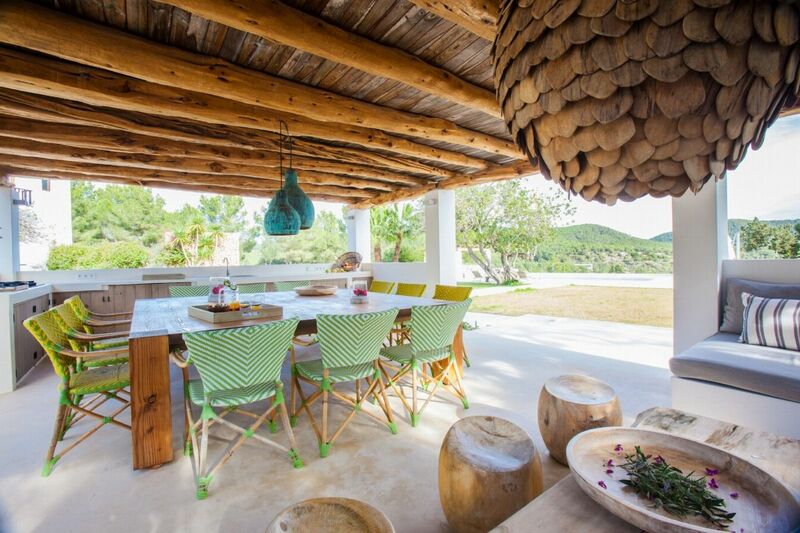 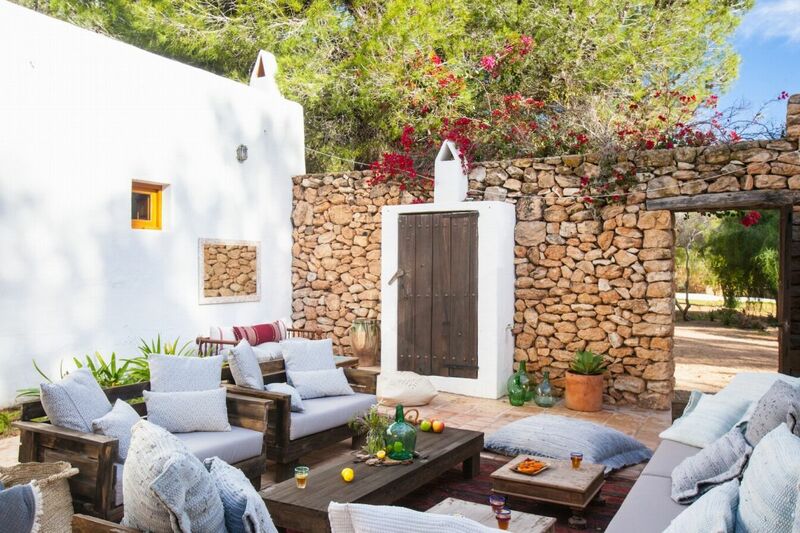 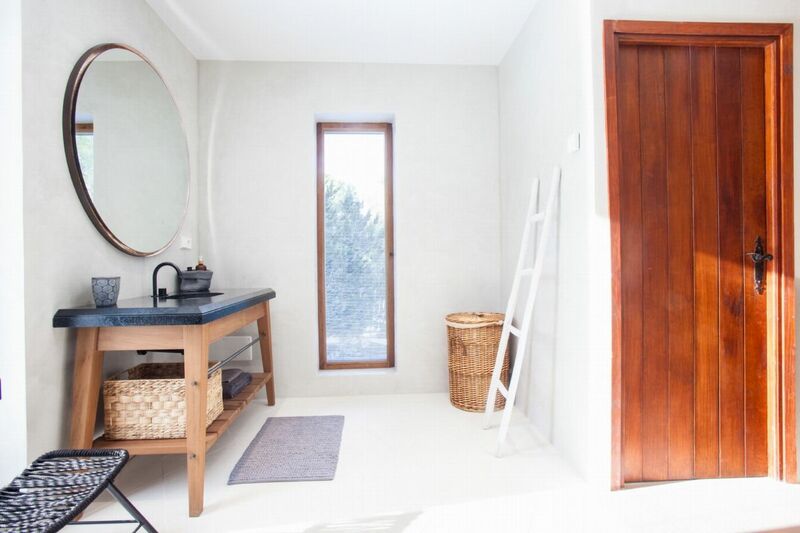 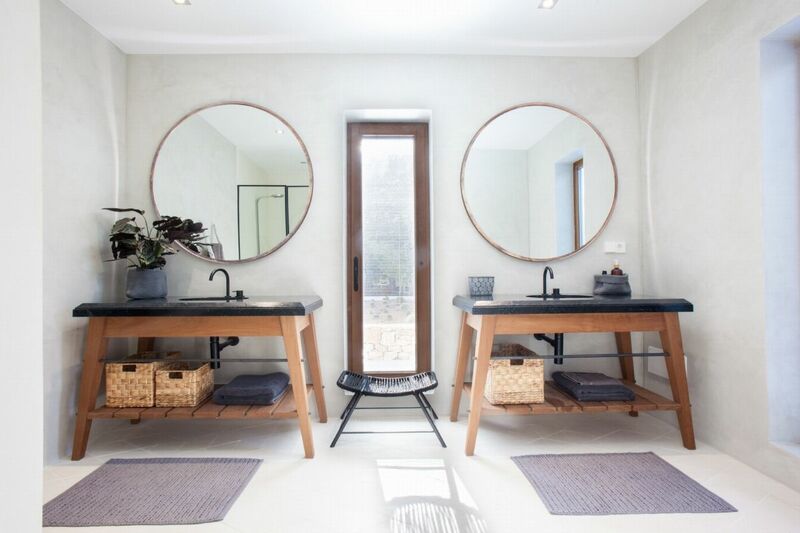 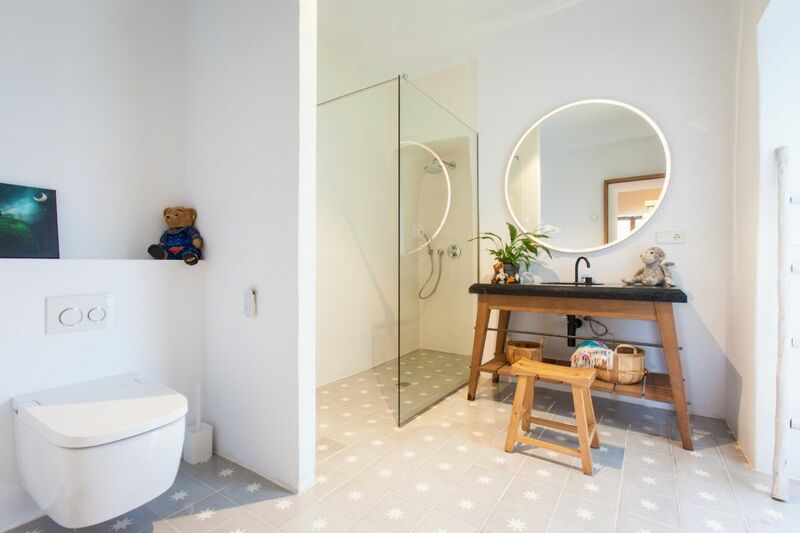 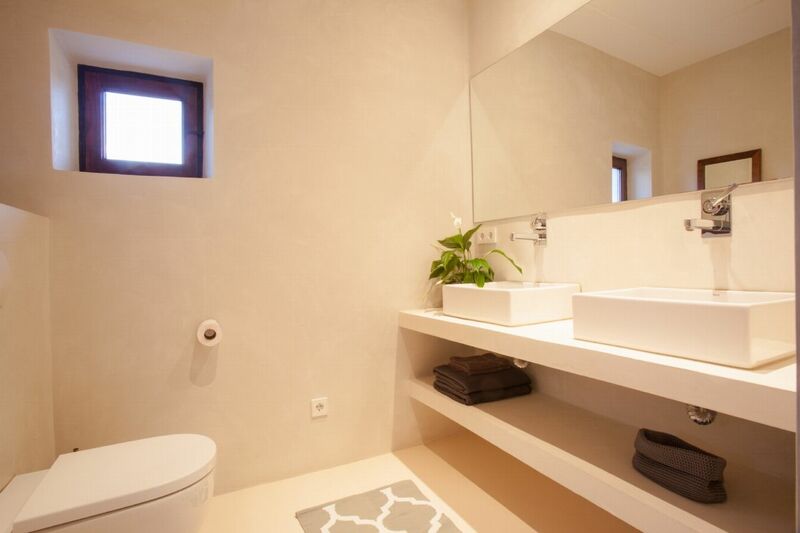 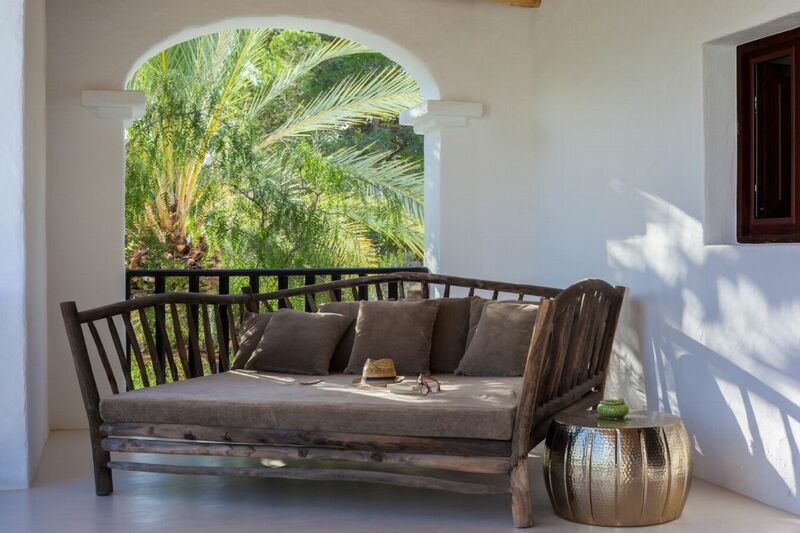 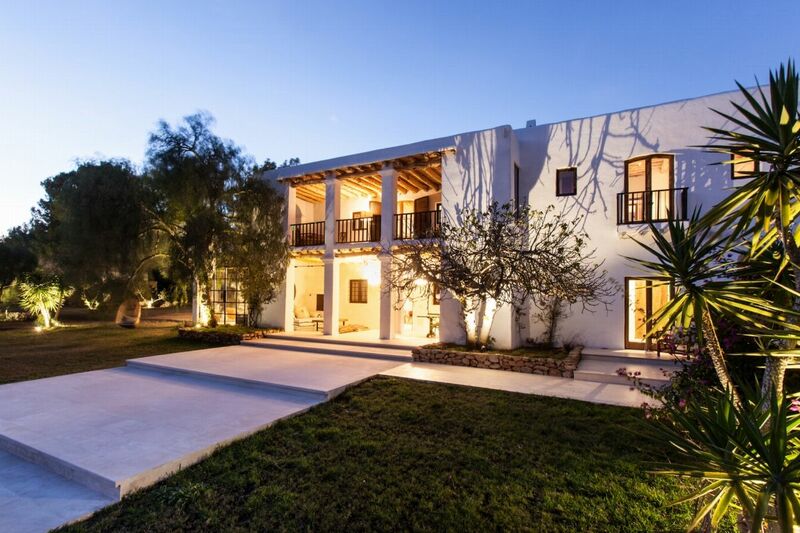 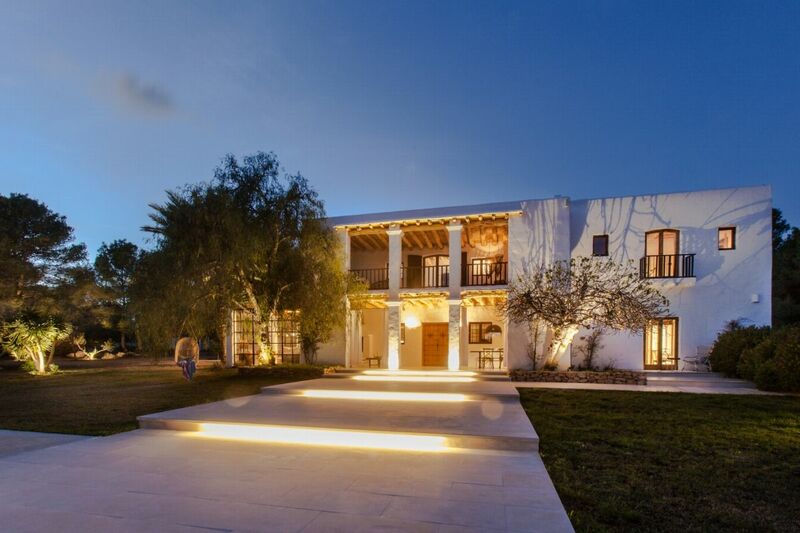 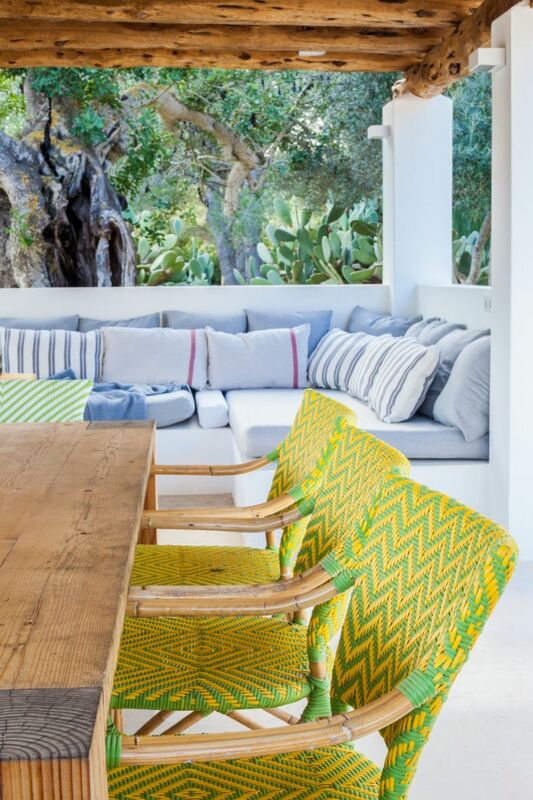 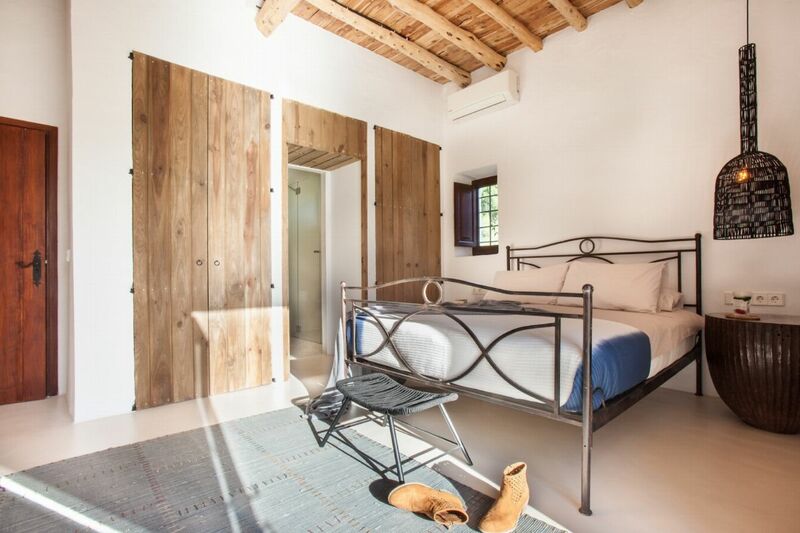 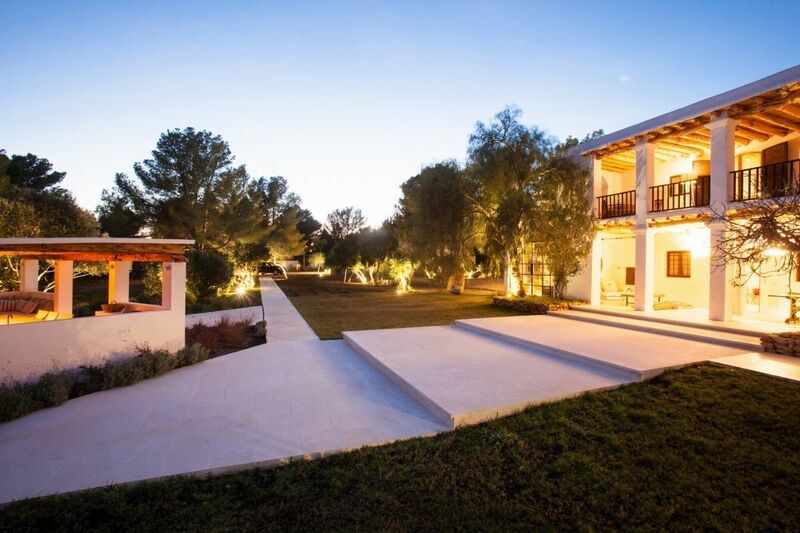 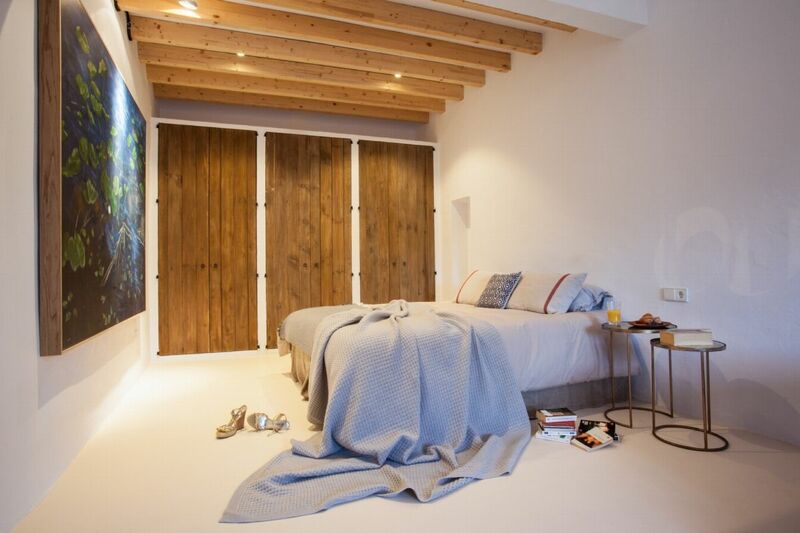 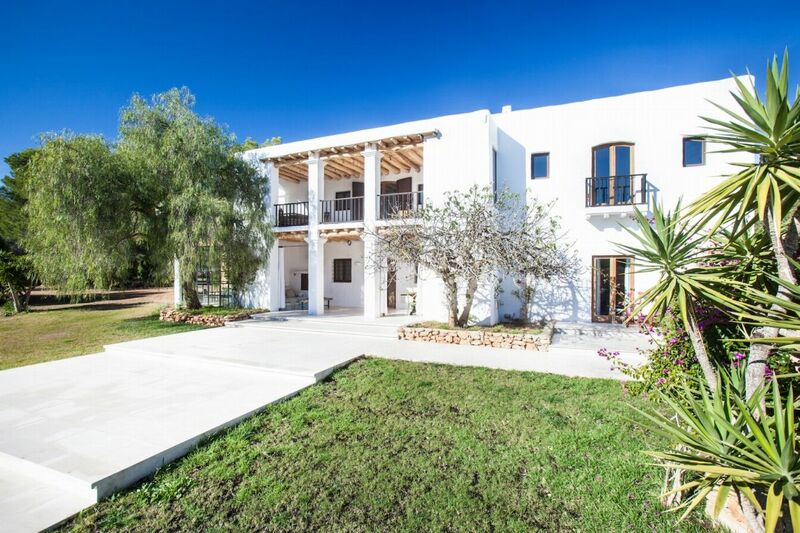 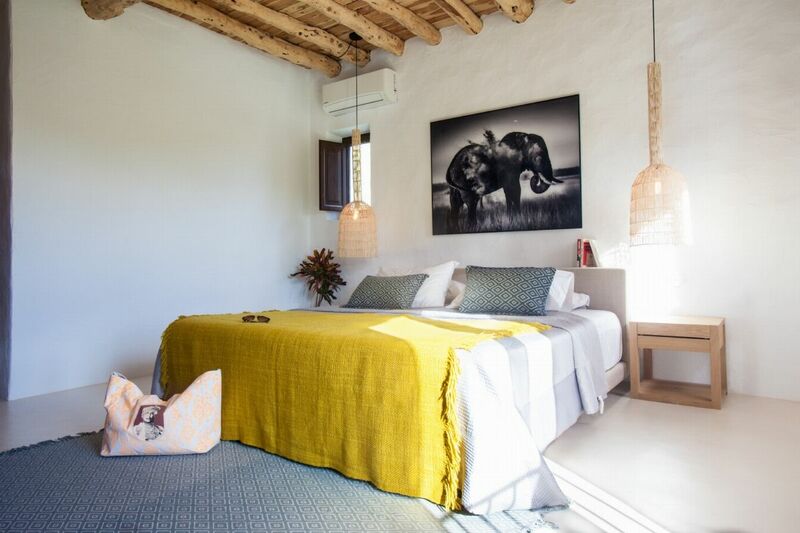 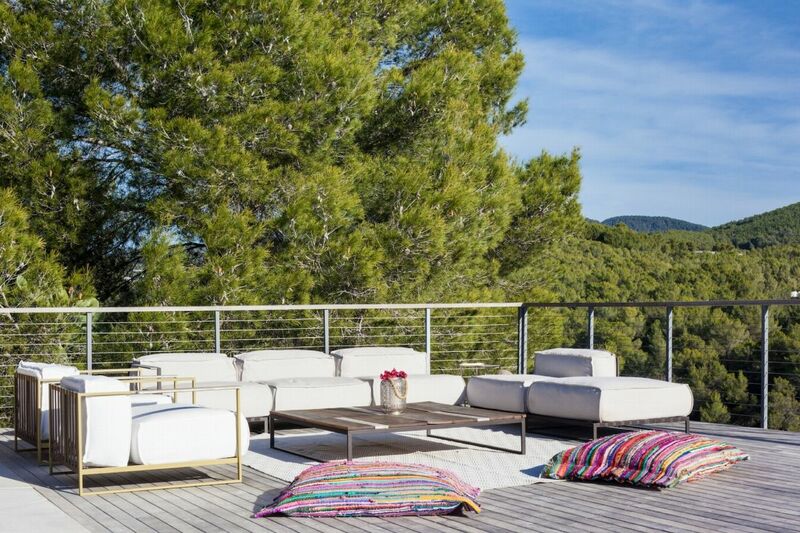 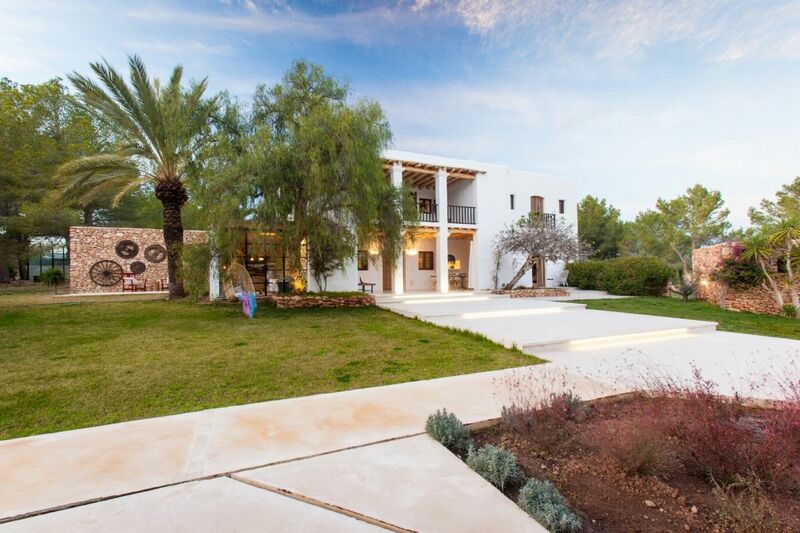 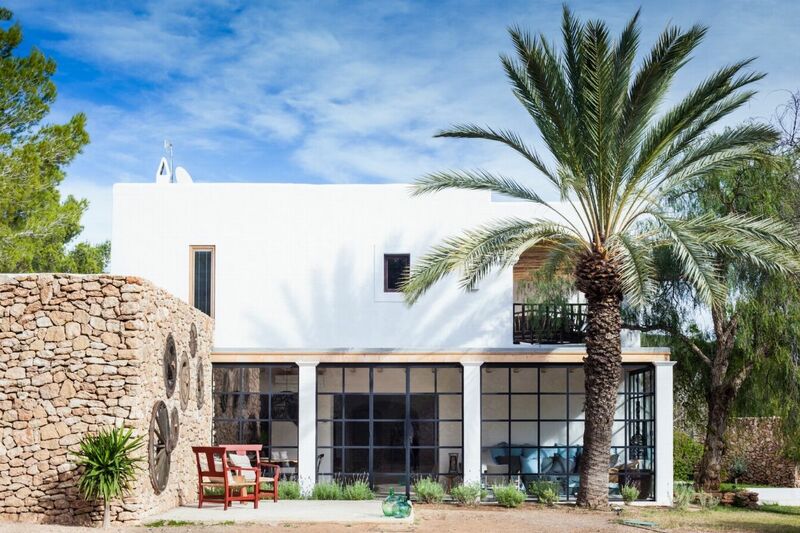 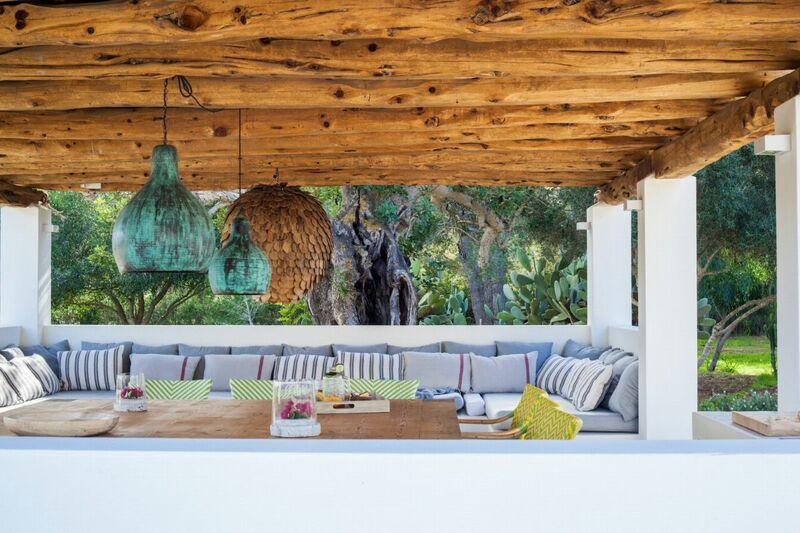 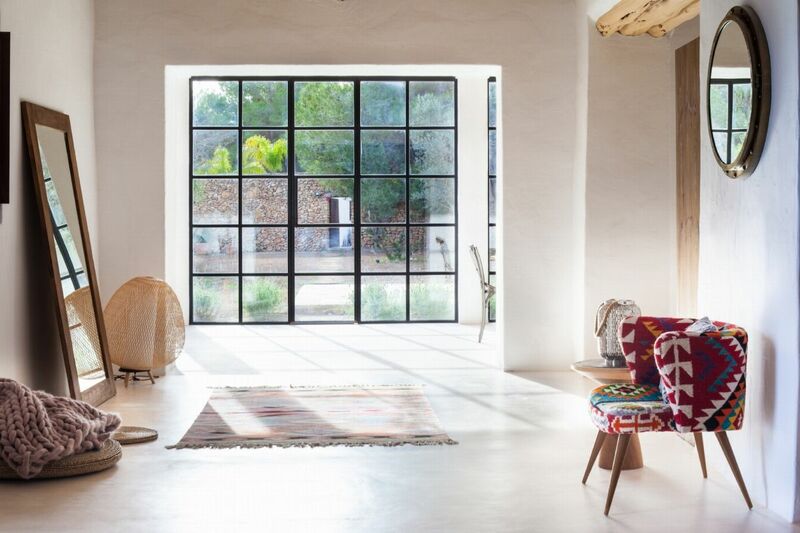 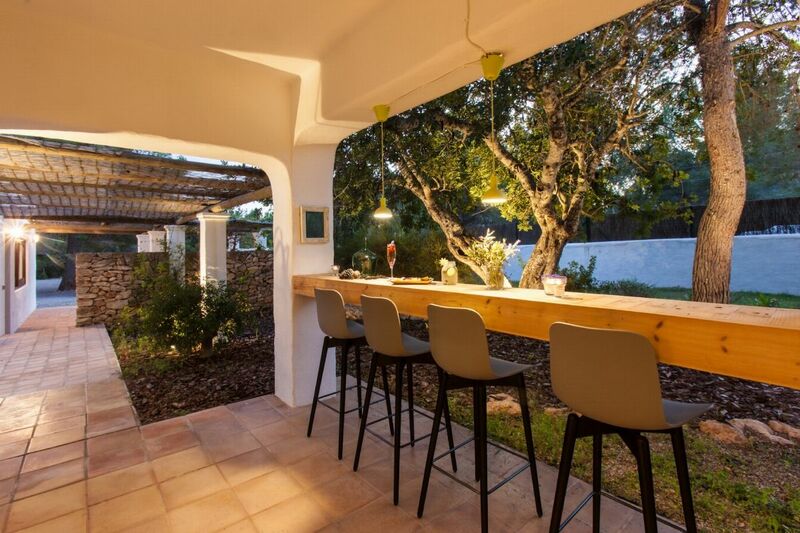 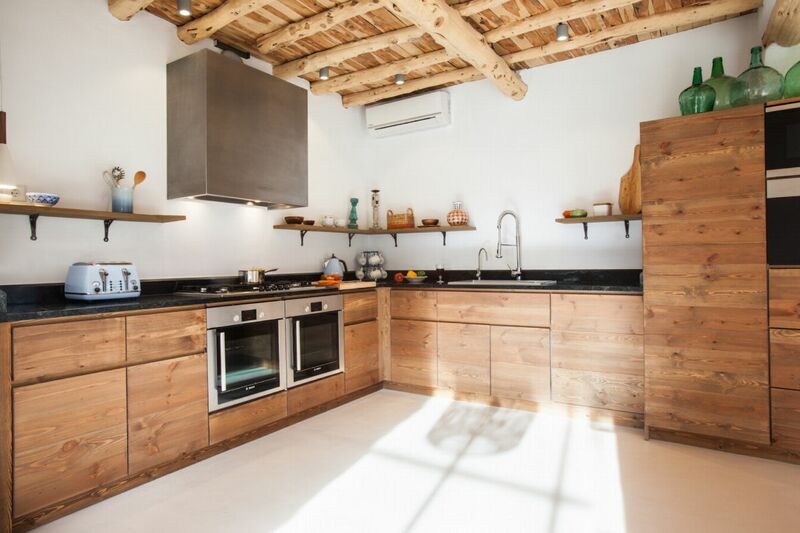 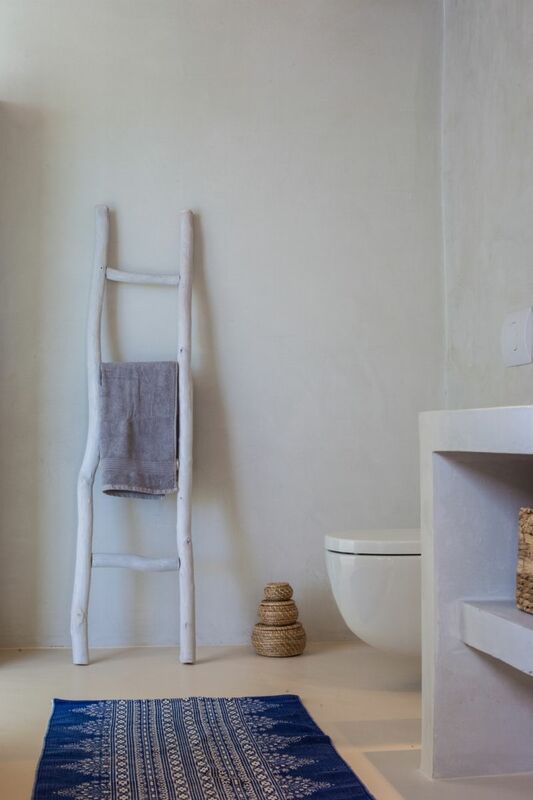 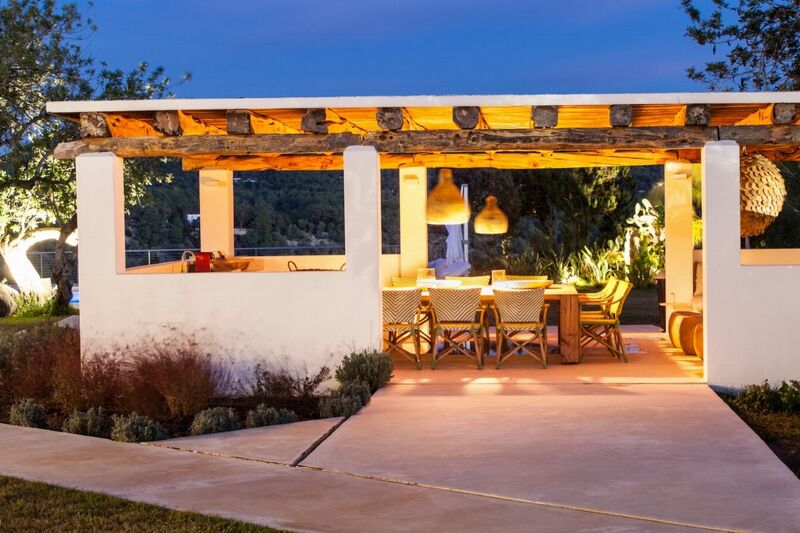 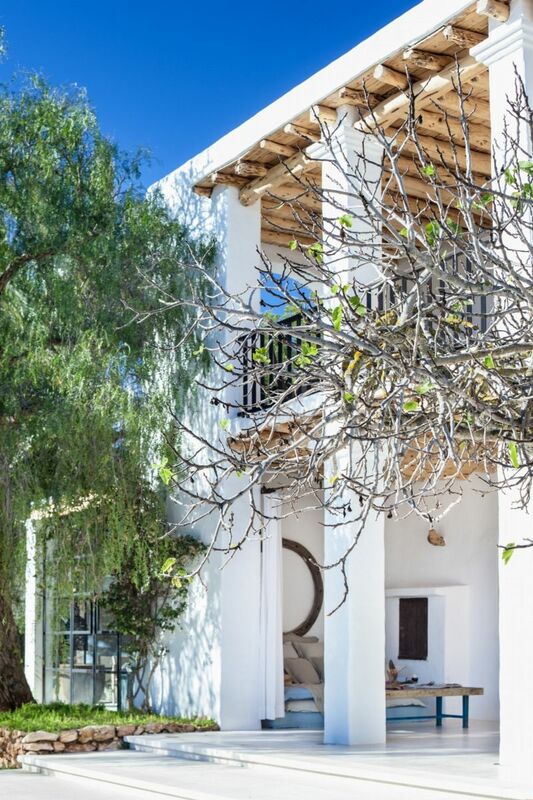 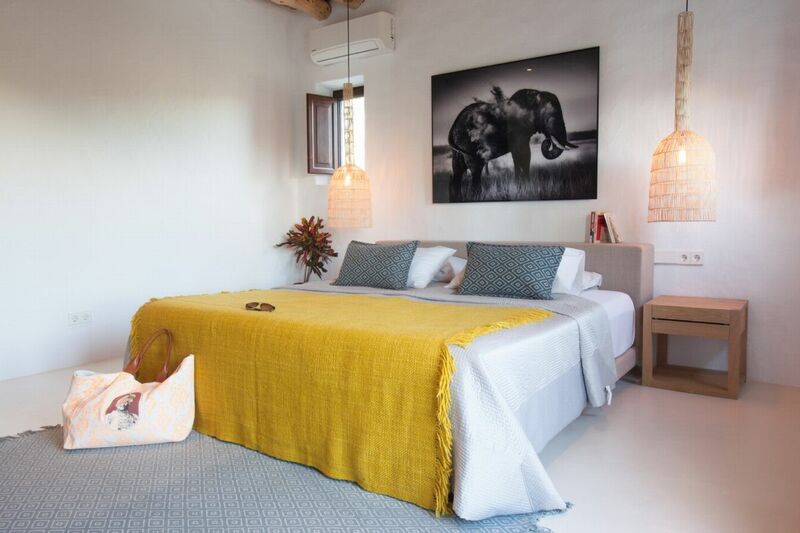 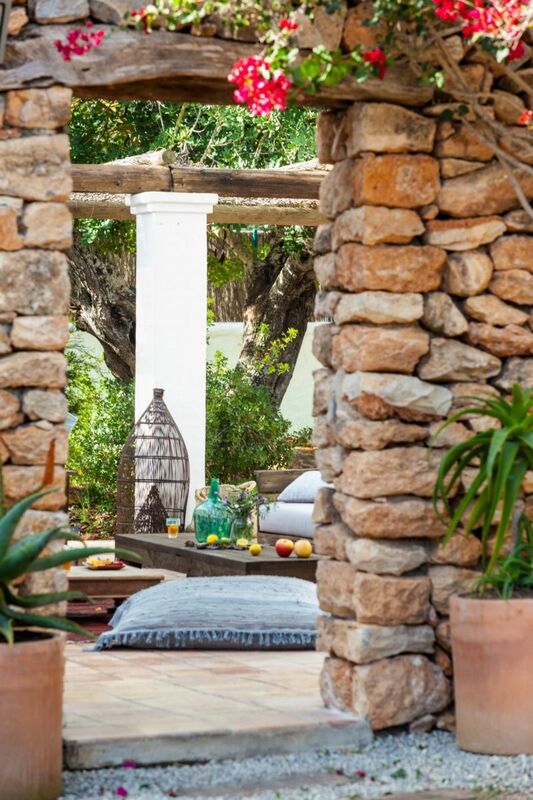 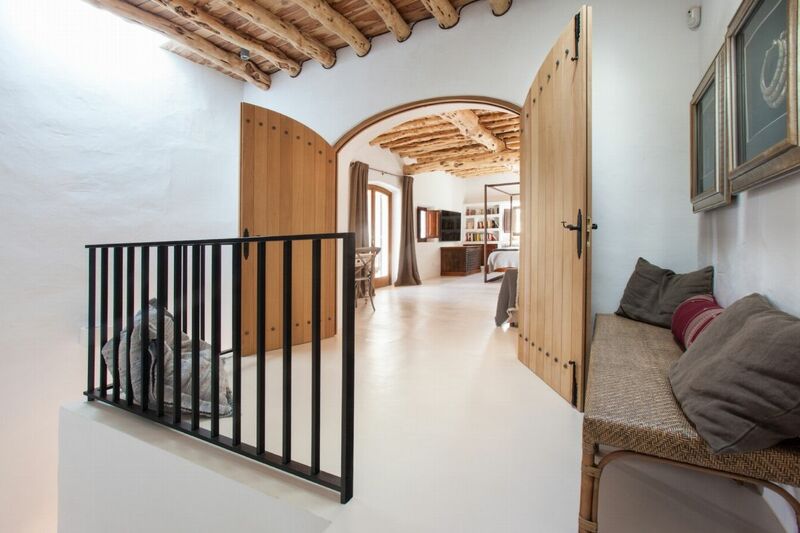 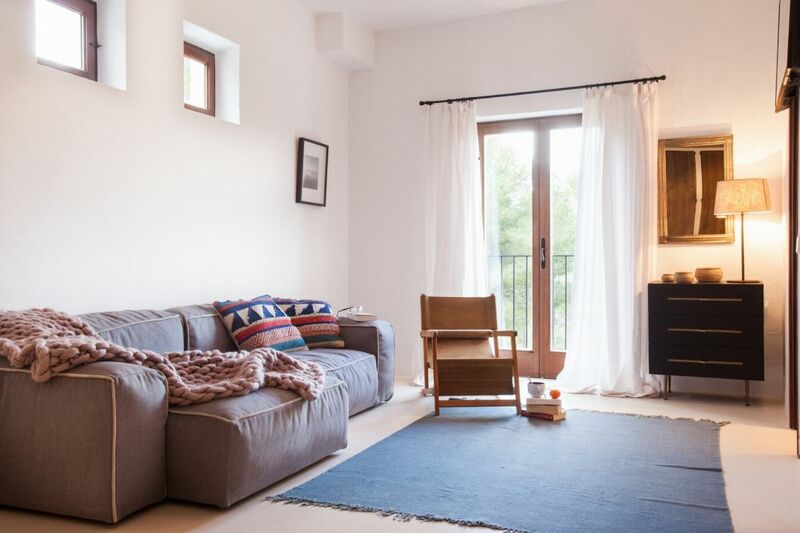 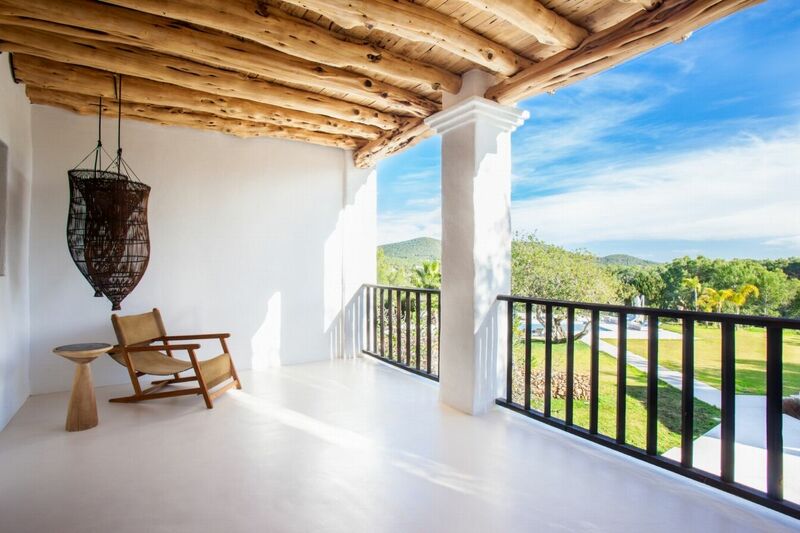 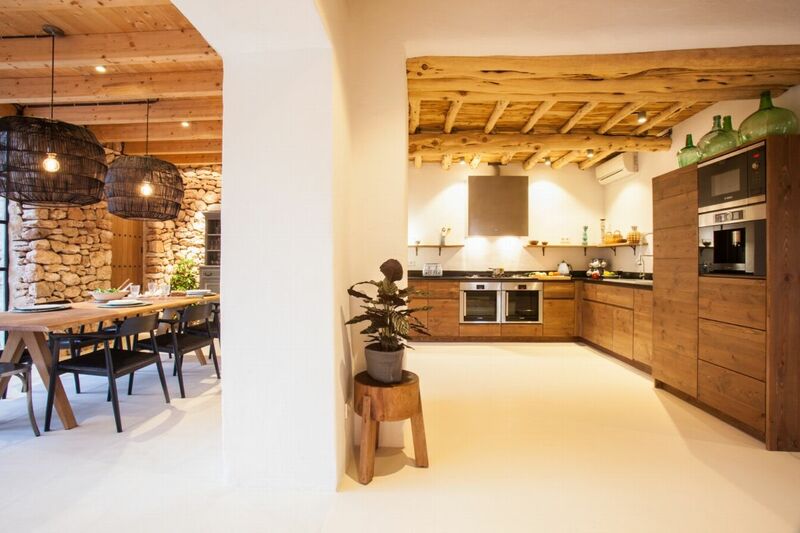 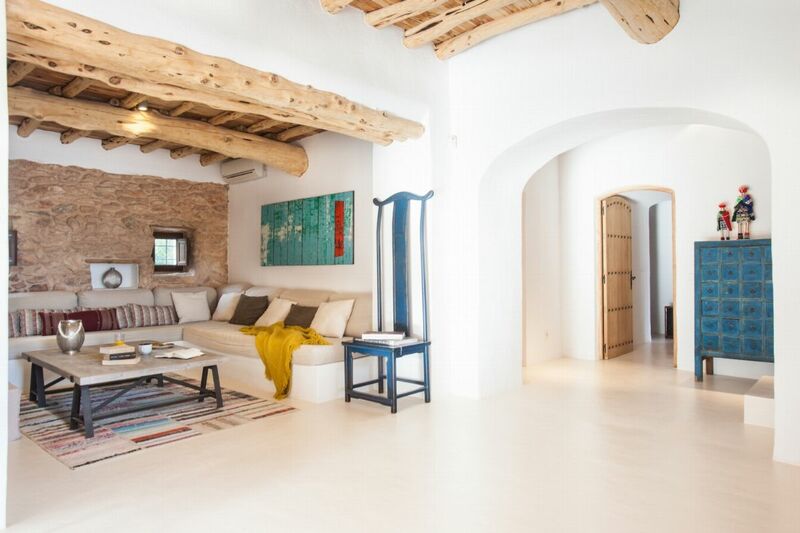 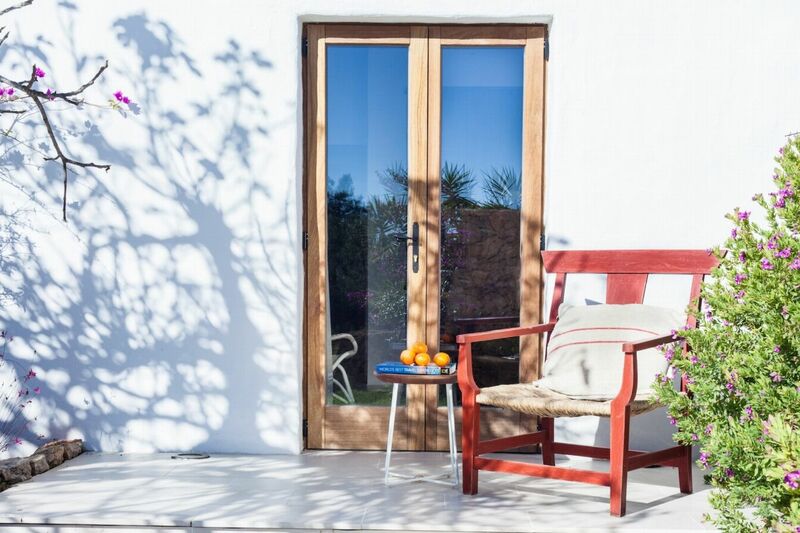 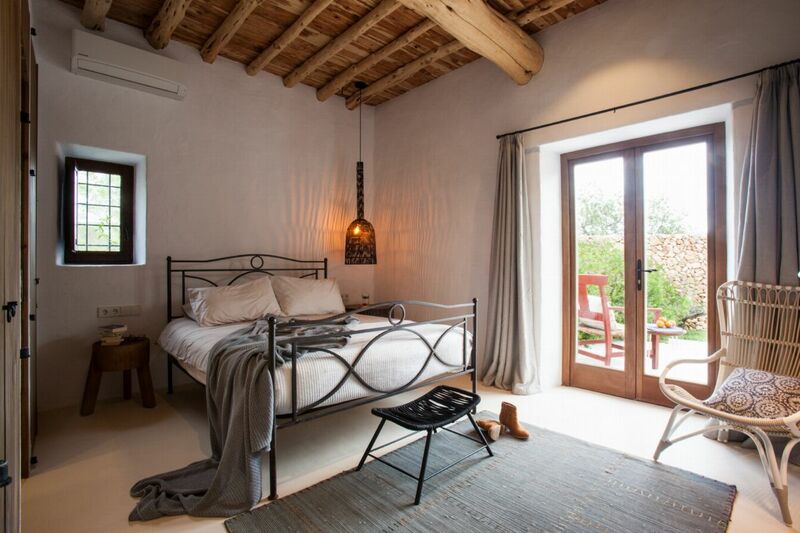 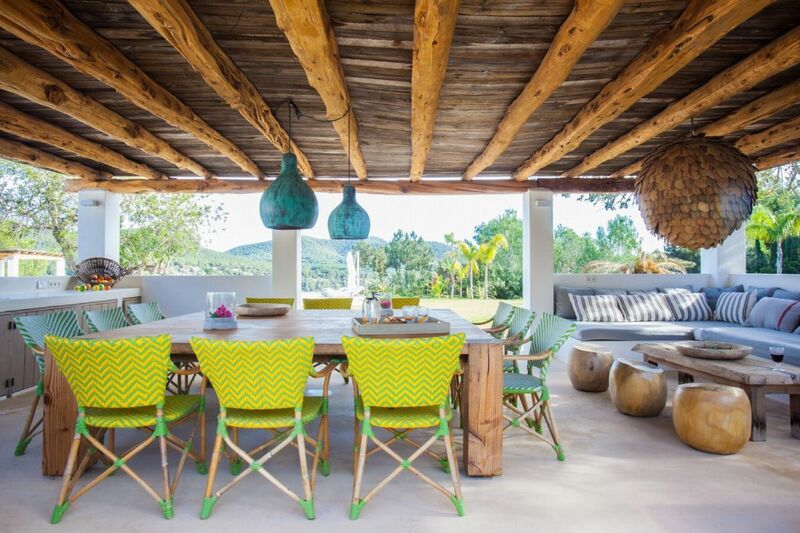 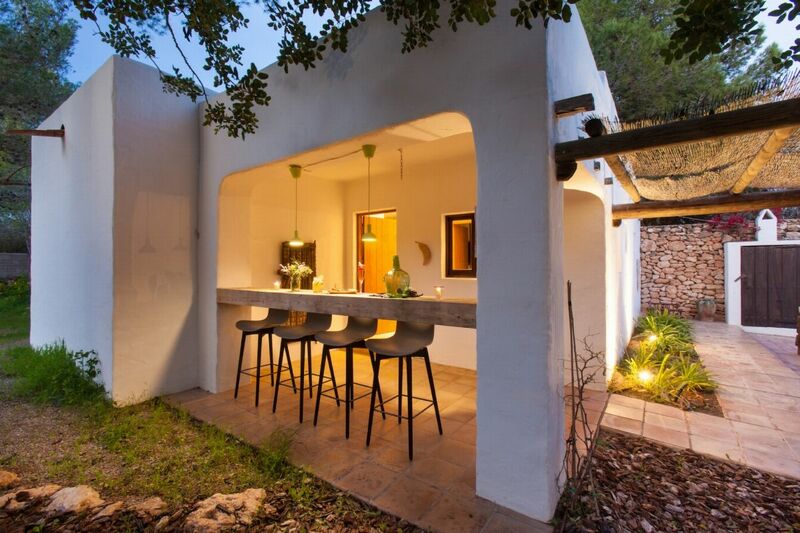 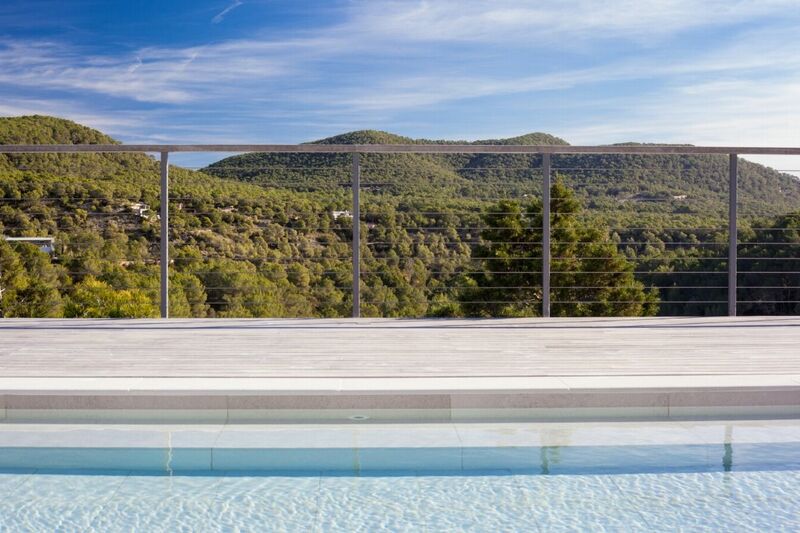 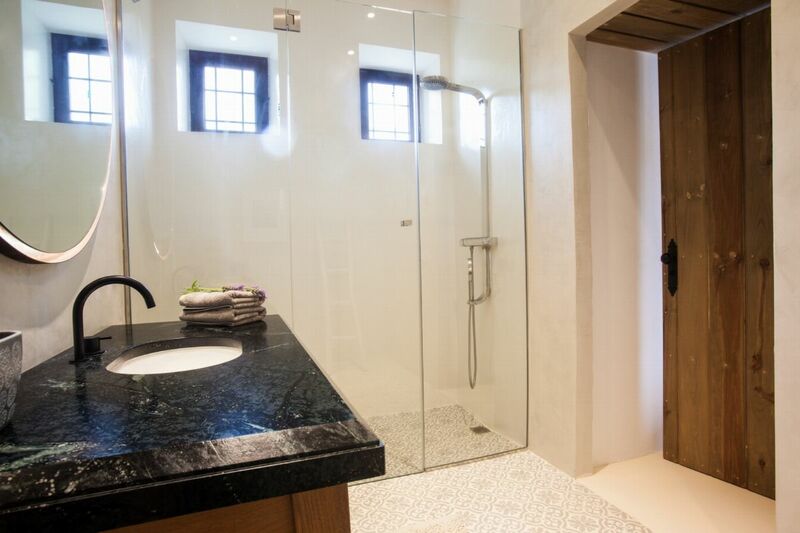 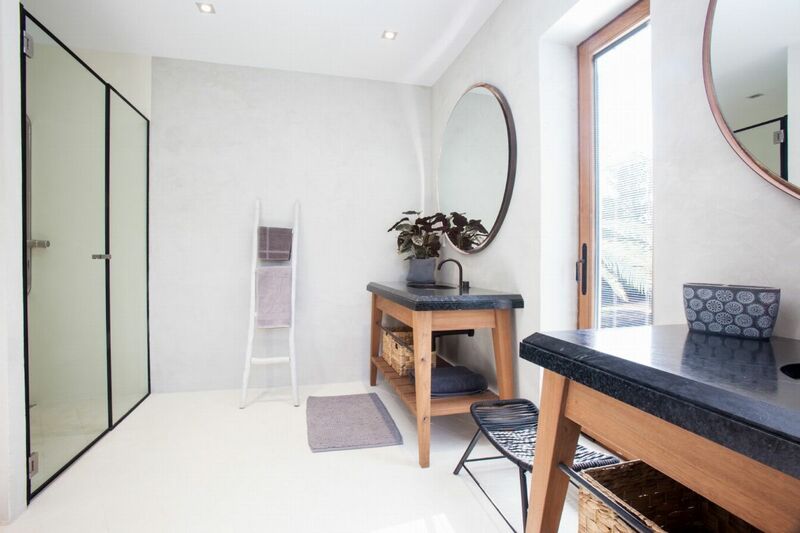 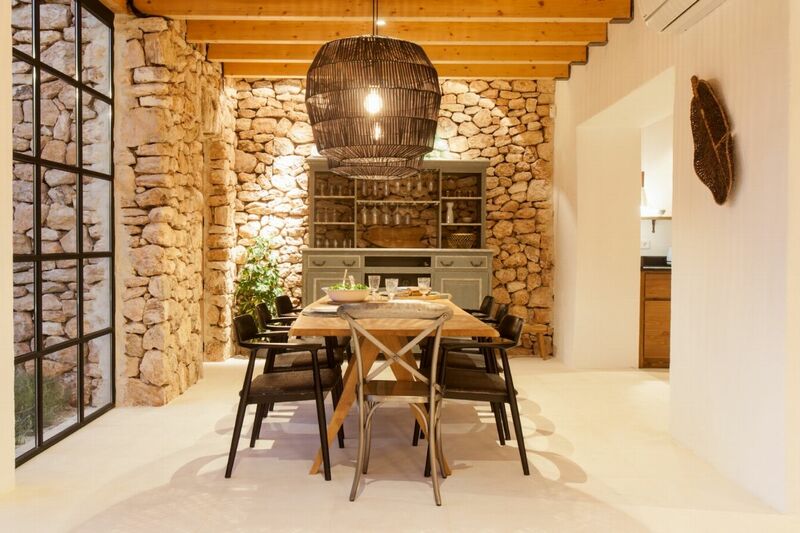 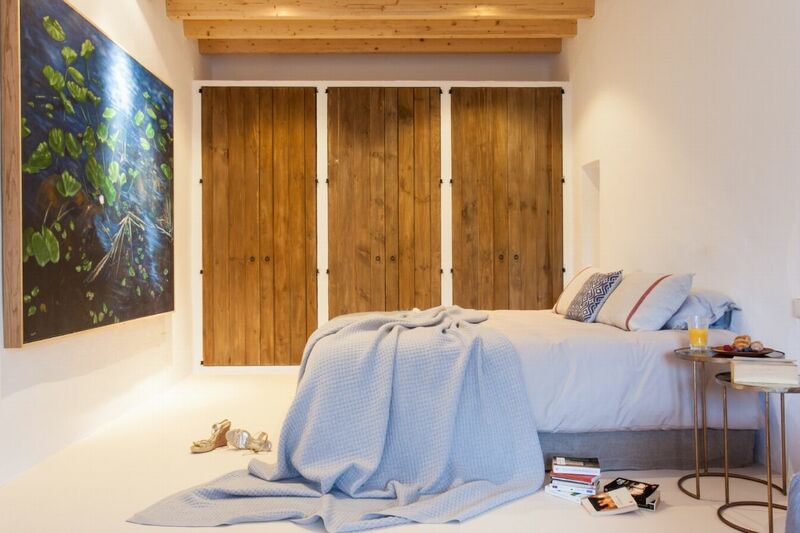 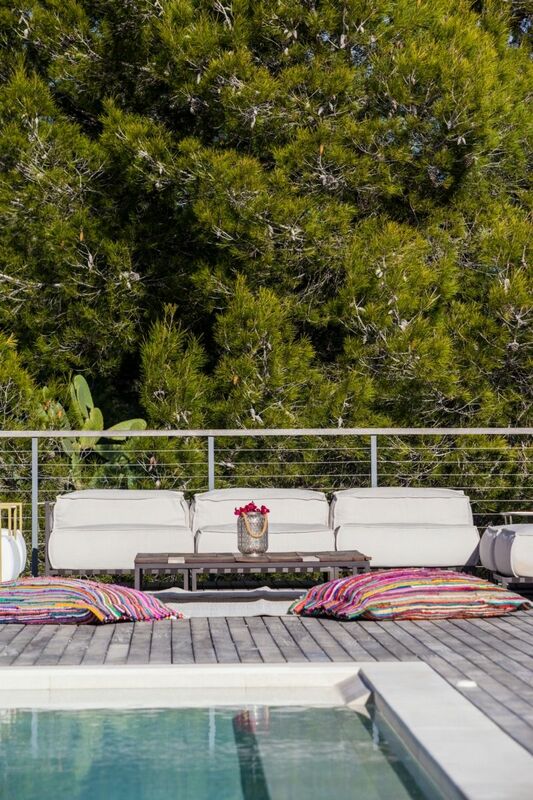 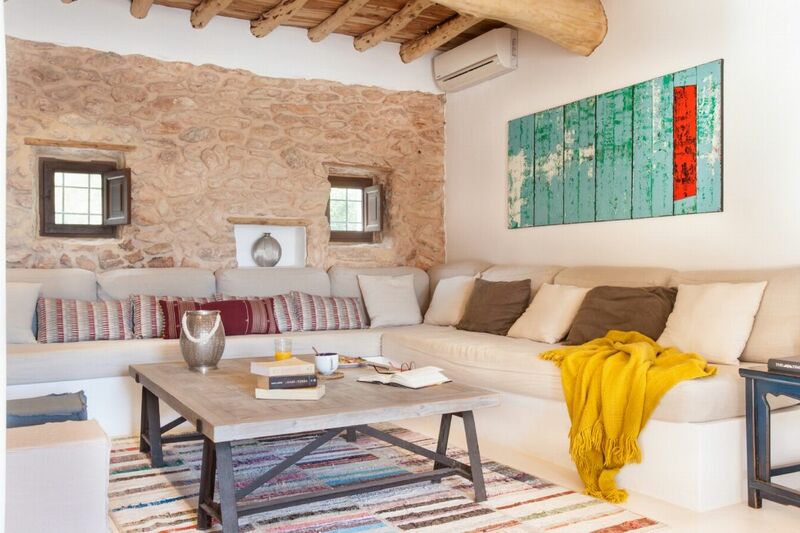 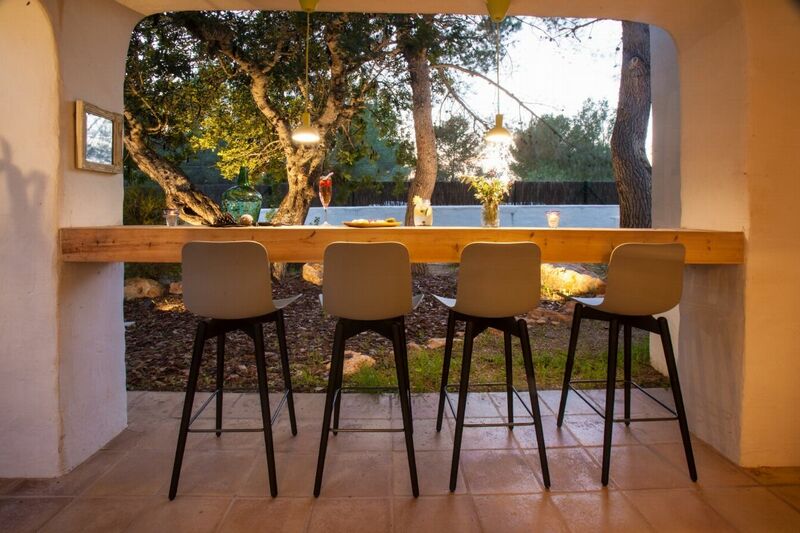 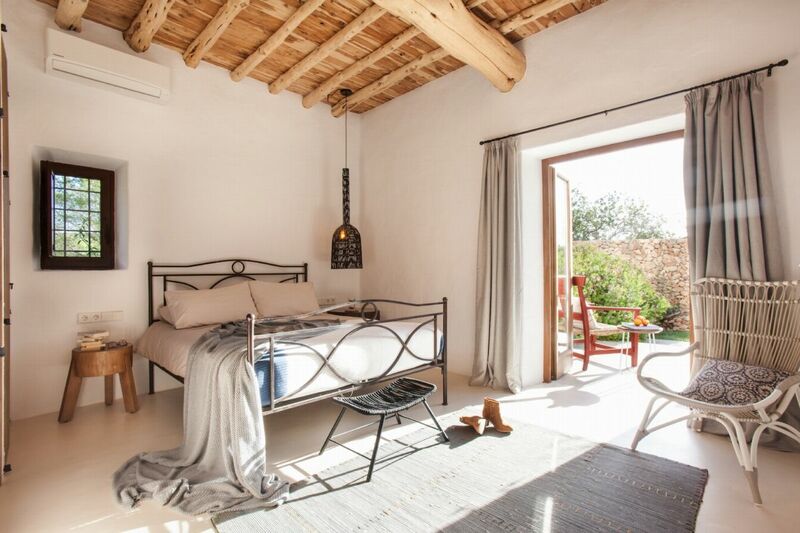 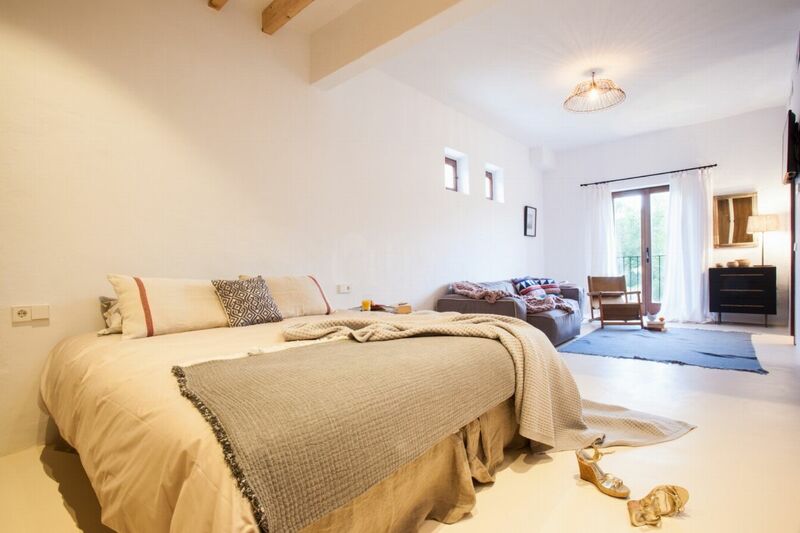 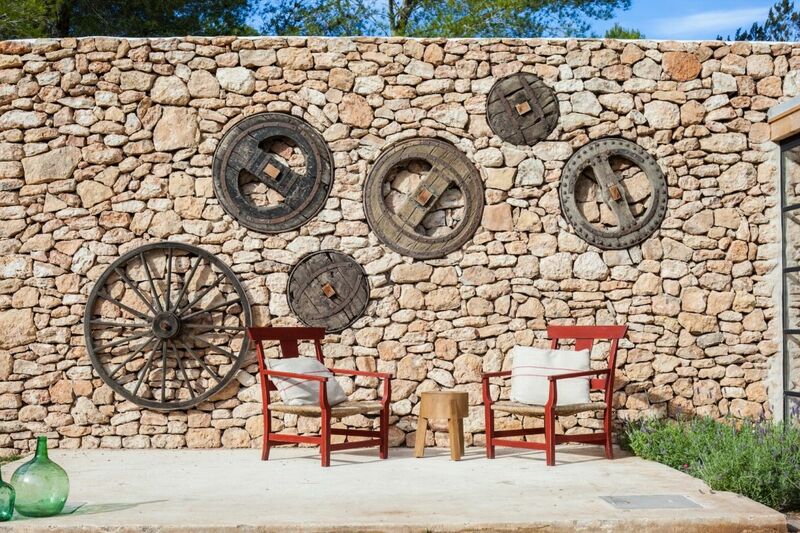 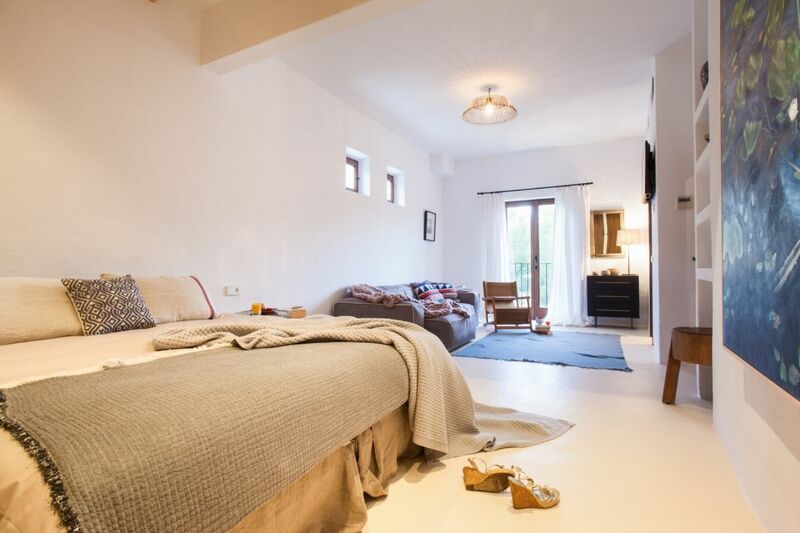 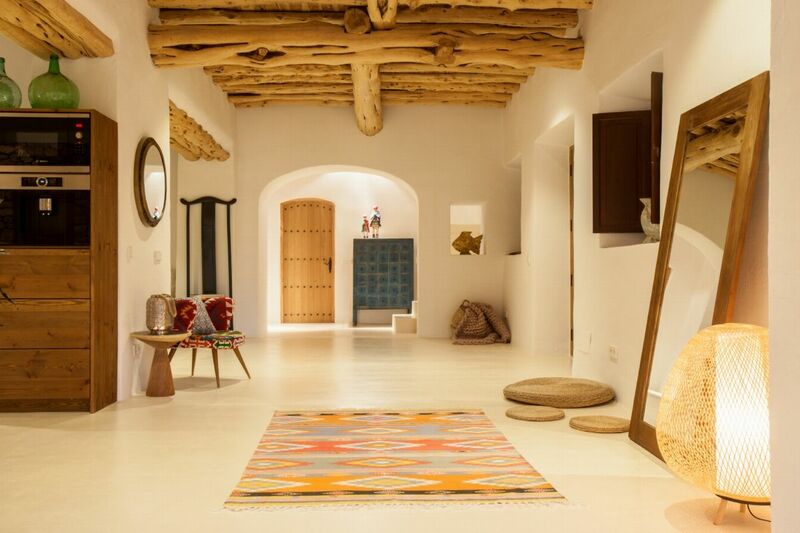 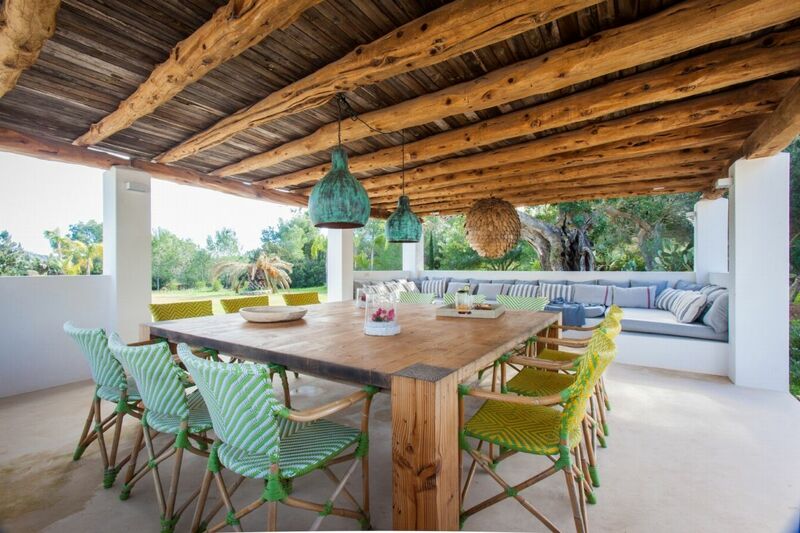 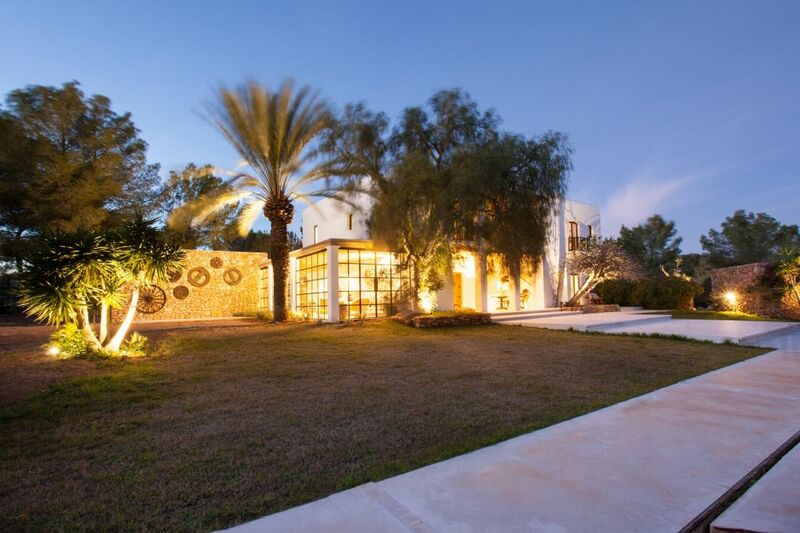 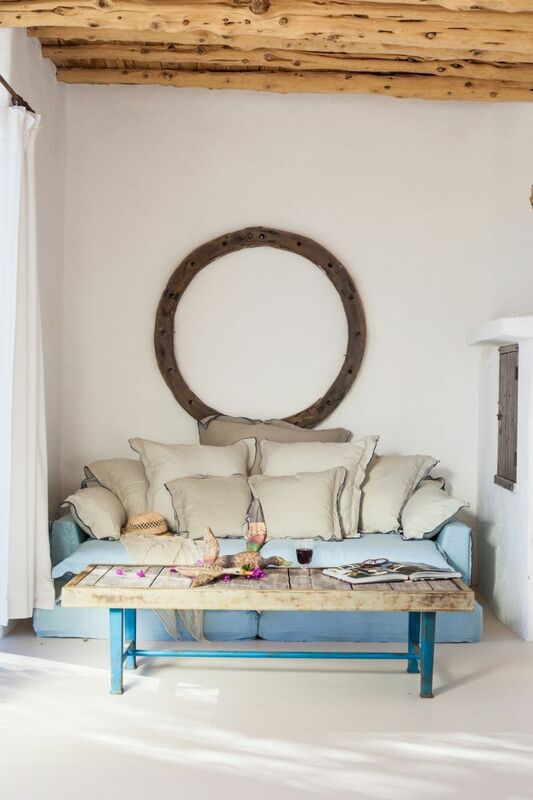 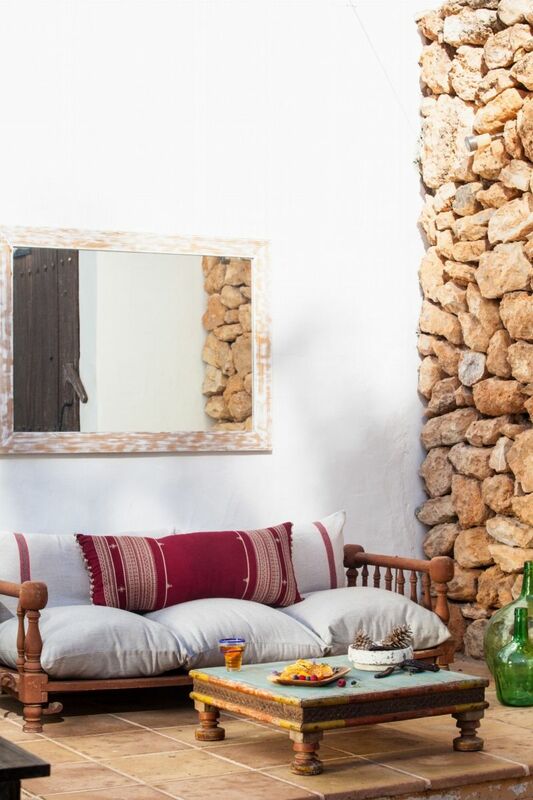 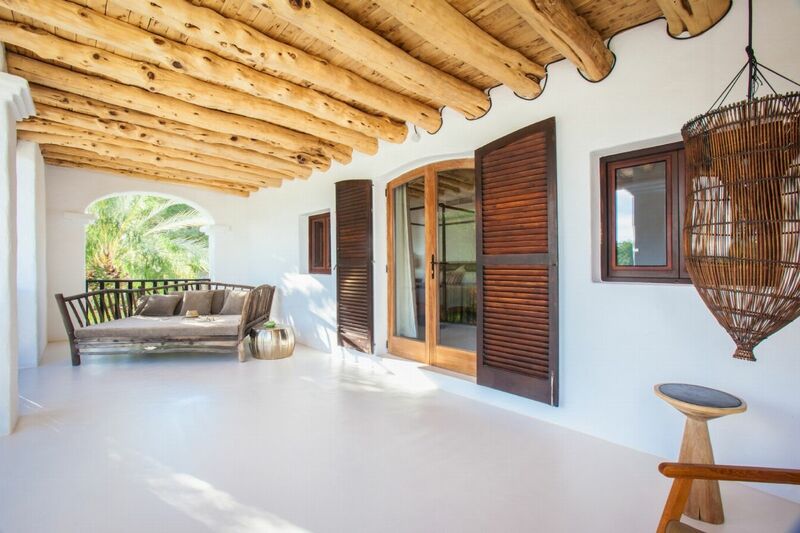 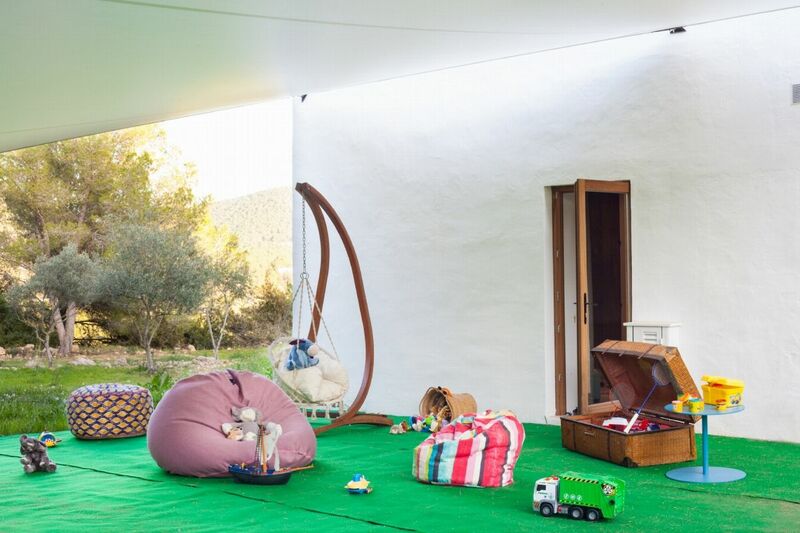 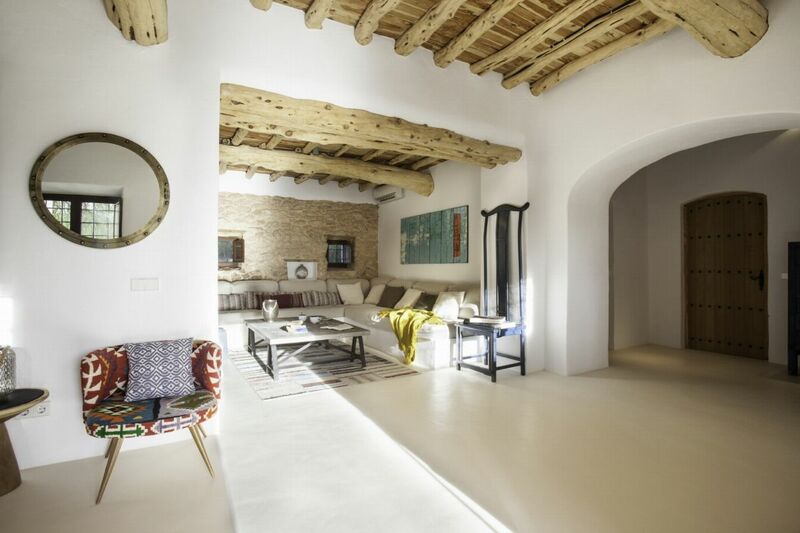 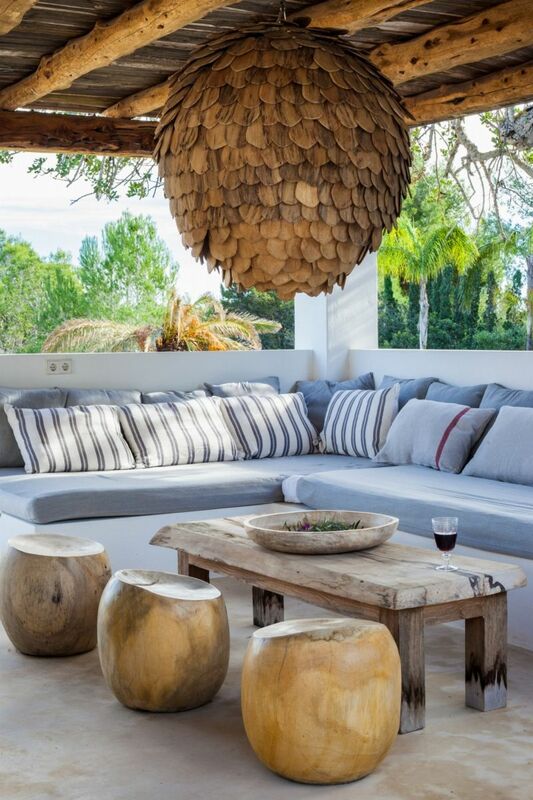 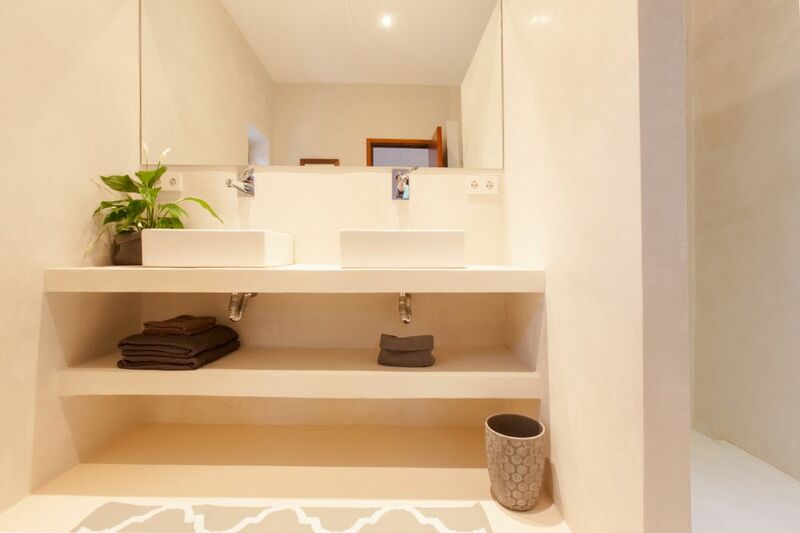 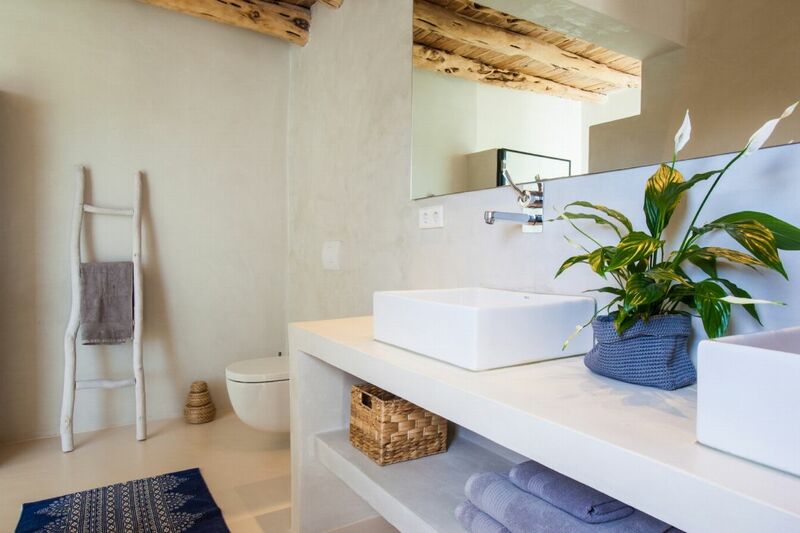 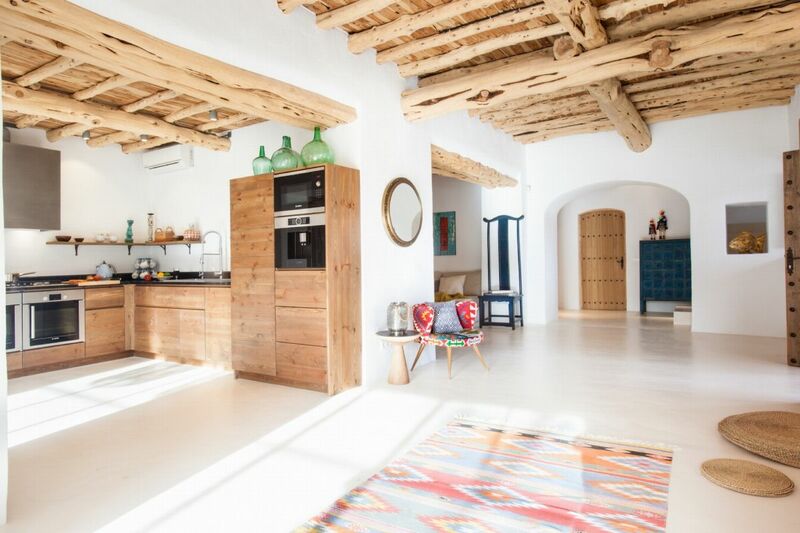 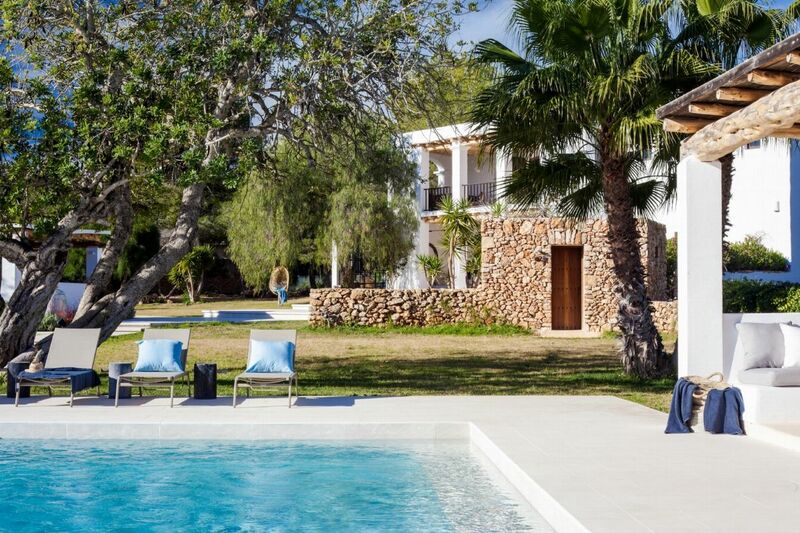 With amazing attention to detail with restored stone walls, wooden-beamed verandas and whitewashed walls, this villa has all you will need to enjoy your time in Ibiza! 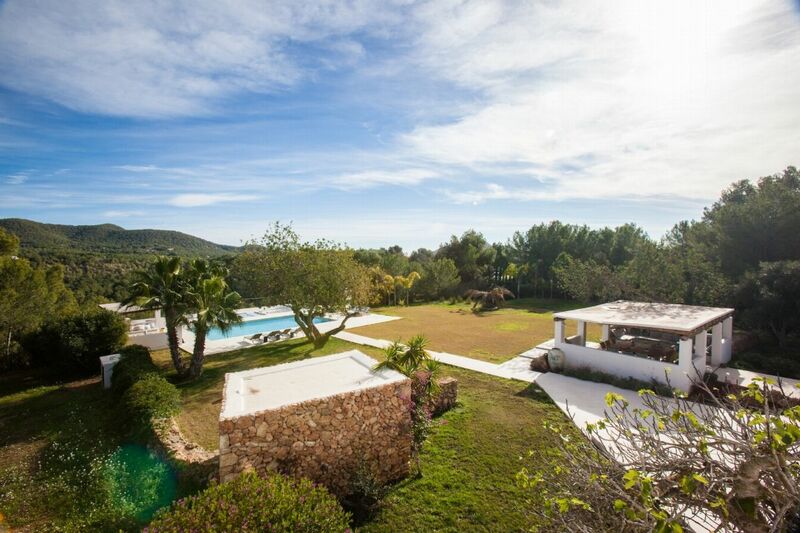 OUTDOOR AREAS There are beautiful gardens with perfectly manicured lawns leading to a stunning pool, outdoor kitchen and several chill-out areas. 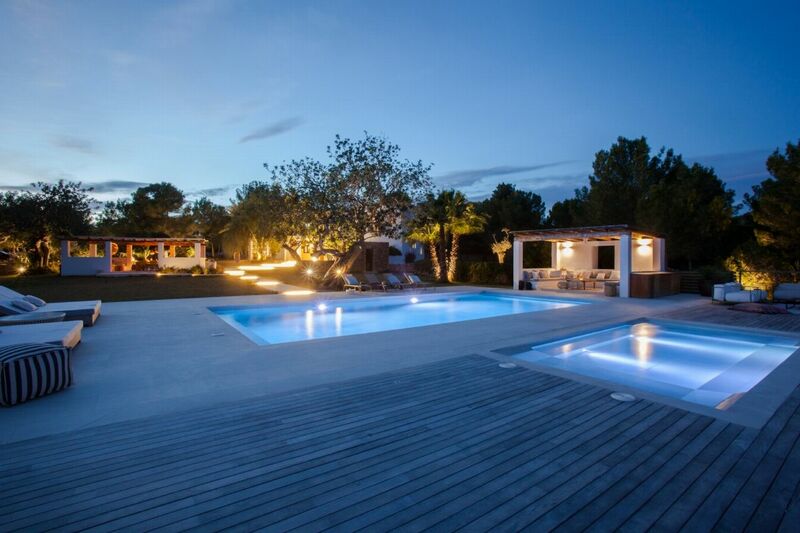 The main pool is heated and there is also a kids pool / Jacuzzi. 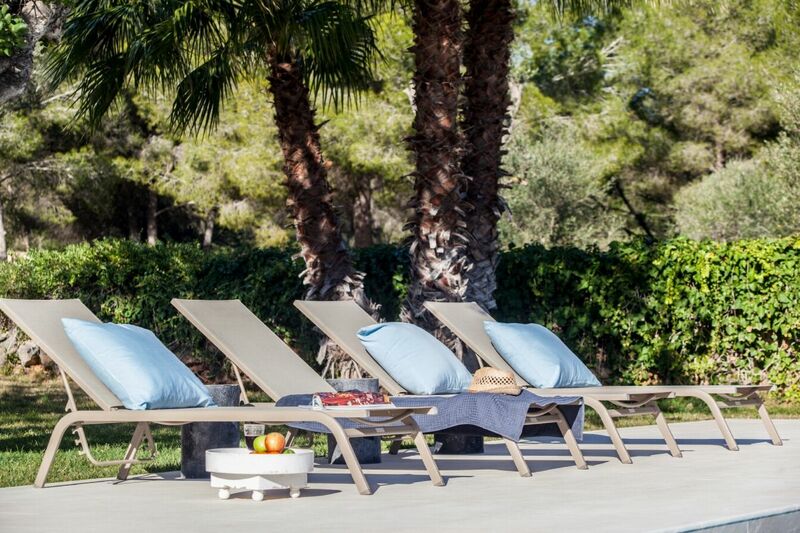 The spacious terrace surrounding the pool features double day beds, a luxurious covered chill-out area and amazing views of the valley beyond. 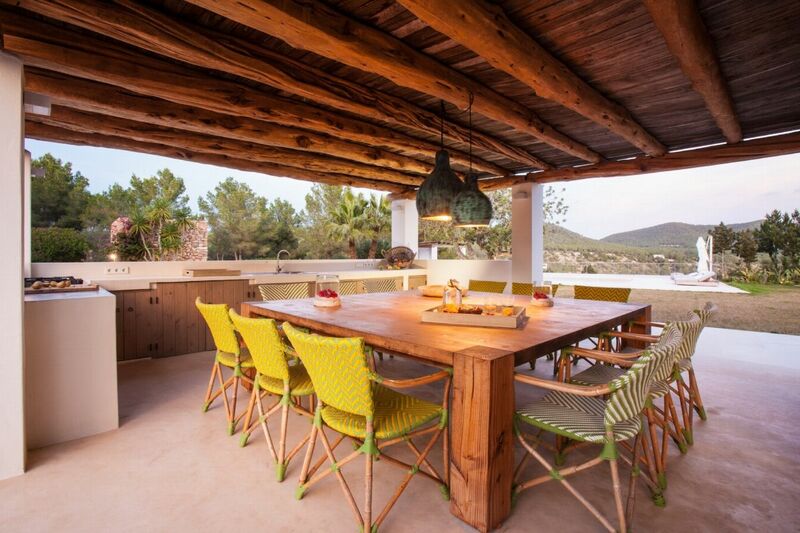 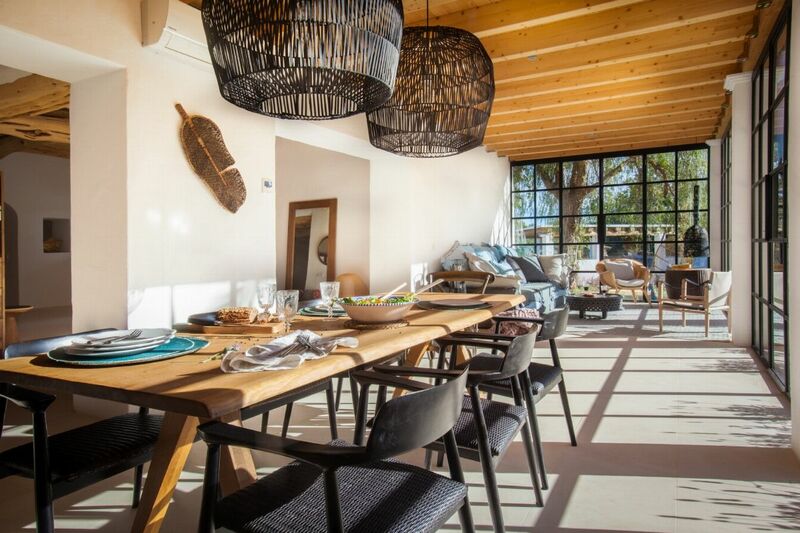 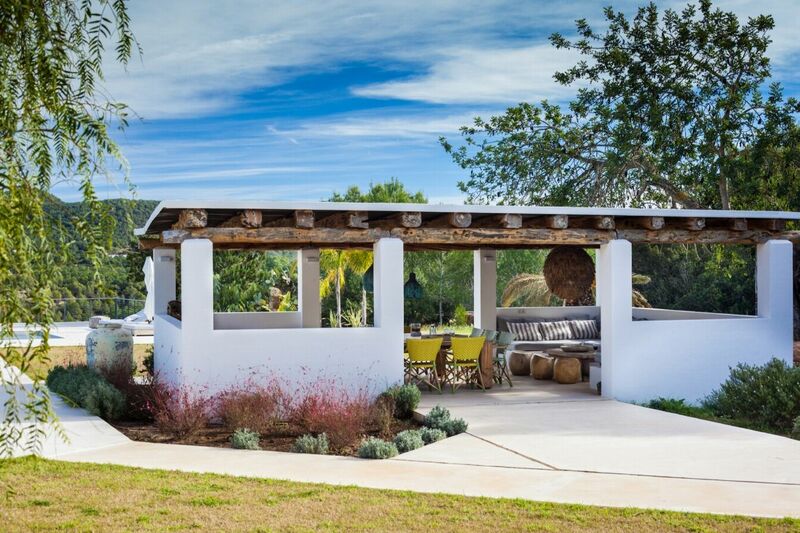 The outdoor kitchen / dining area are fully equipped to enjoy BBQs with family and friends, it is the perfect place to spend your evenings after a day spent floating in the pool, sunbathing by the pool or lounging in the shade. 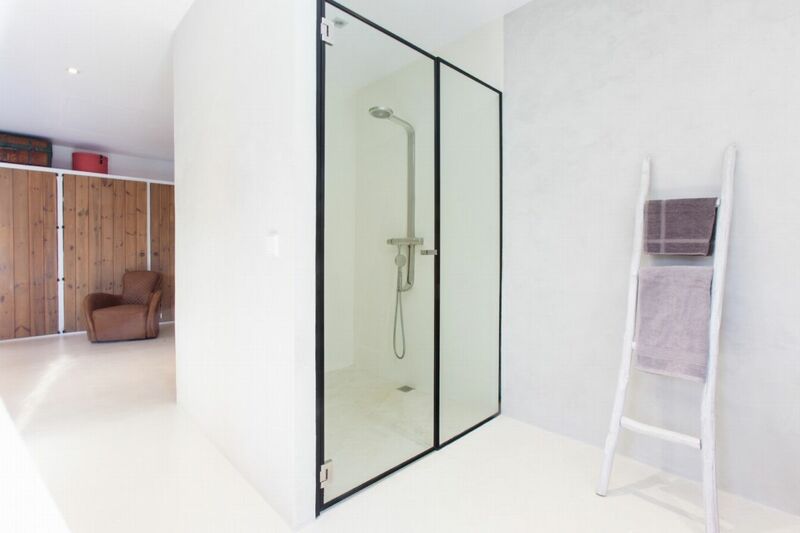 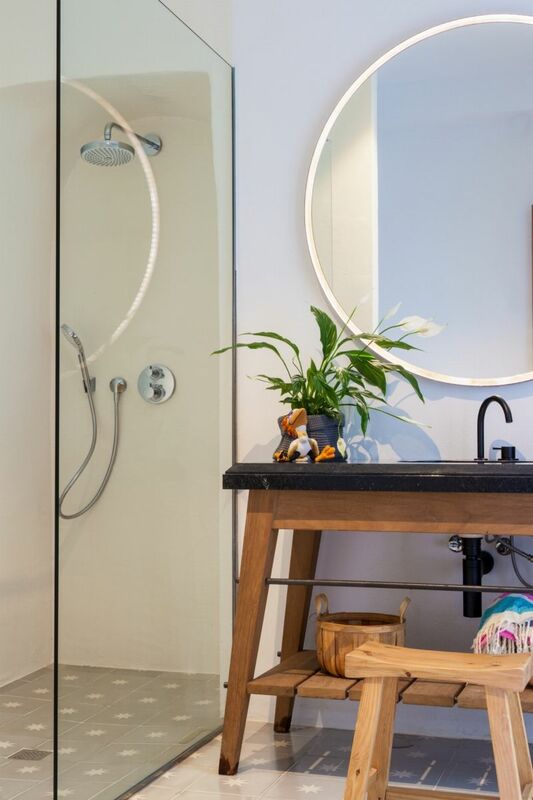 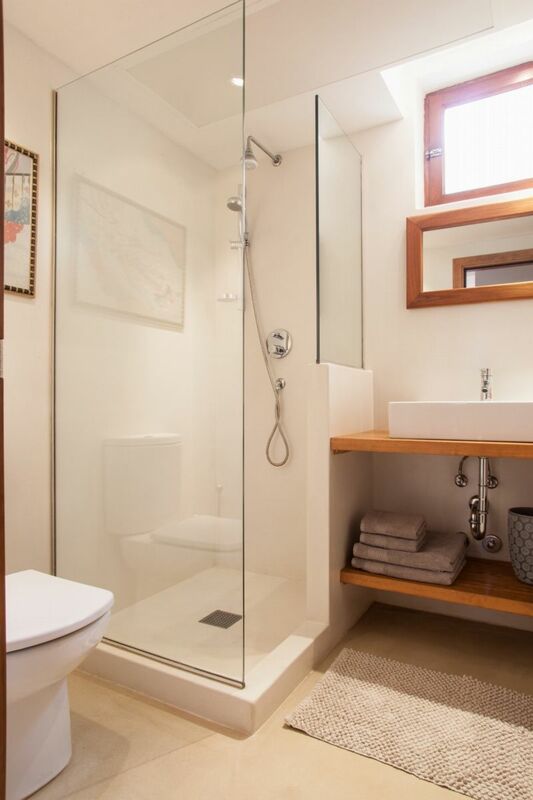 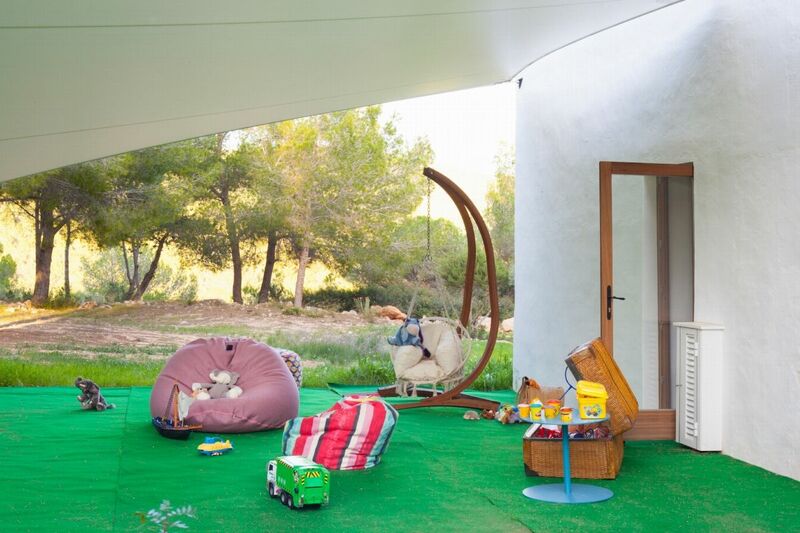 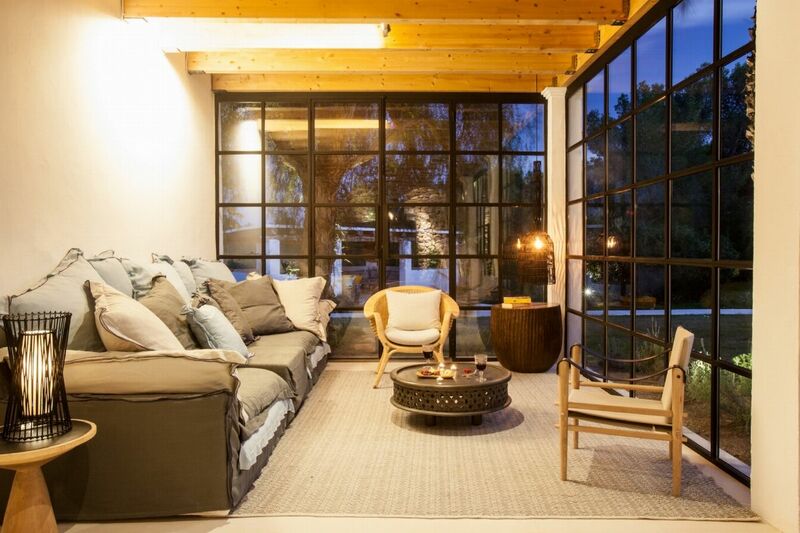 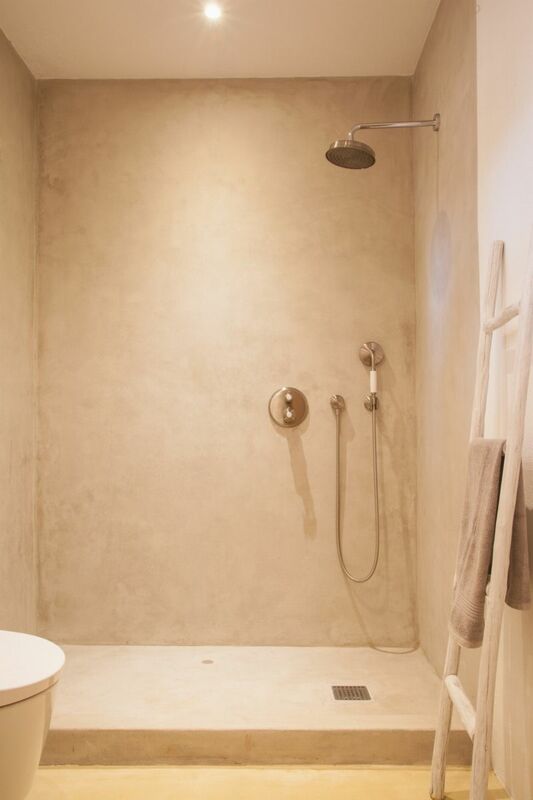 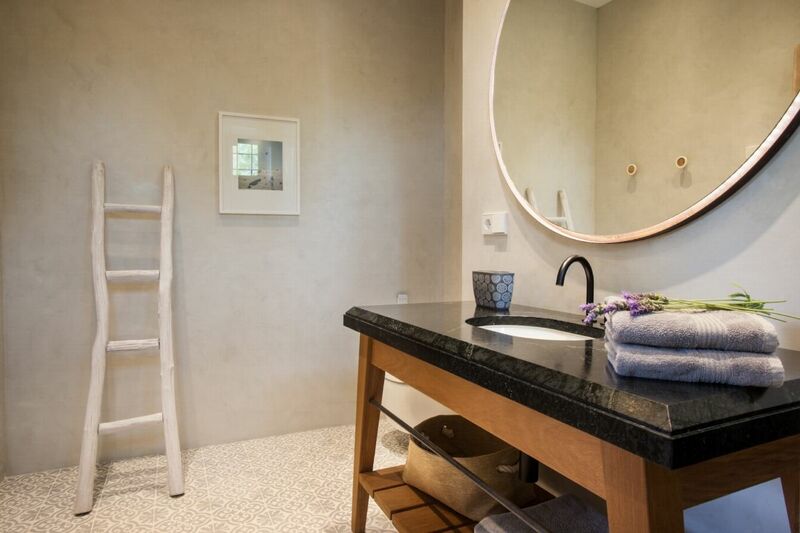 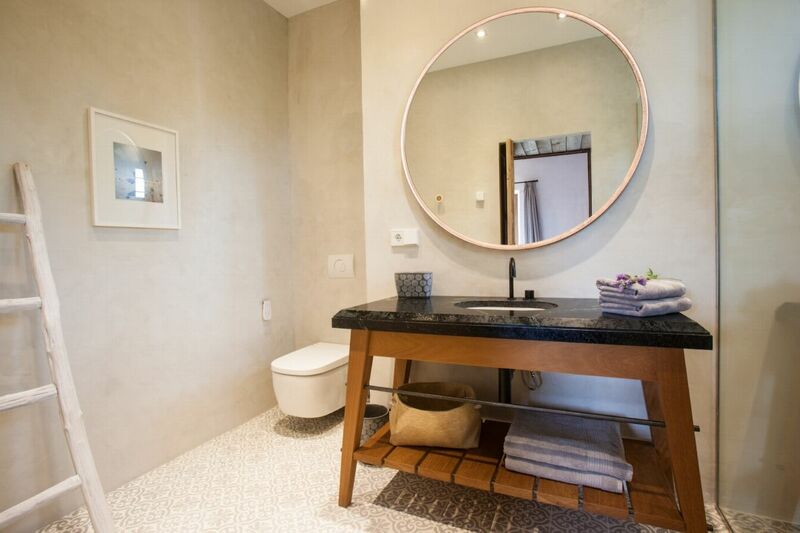 Other outdoor areas include a tennis court, a children's outdoor play area and an outdoor bathroom with showers. 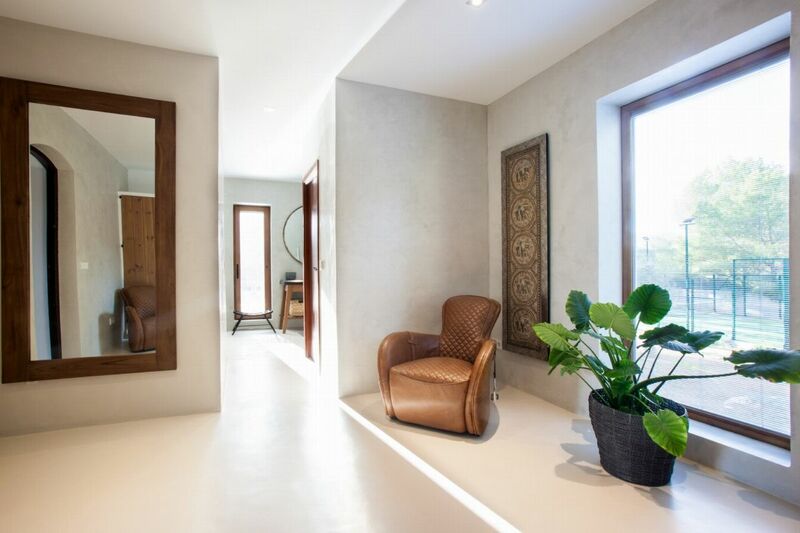 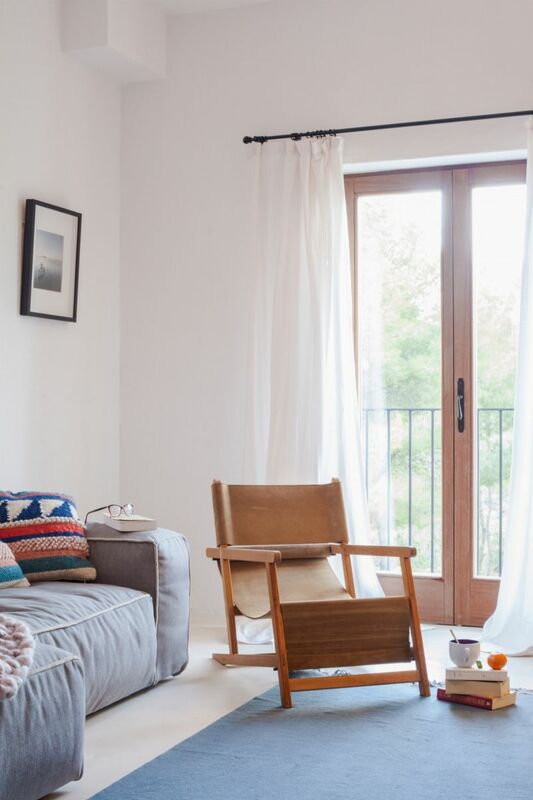 LIVING AREAS Interiors are minimalist and modern with bright, open-plan spaces, there is air conditioning throughout the house, all individually controlled as well as access to WiFi. 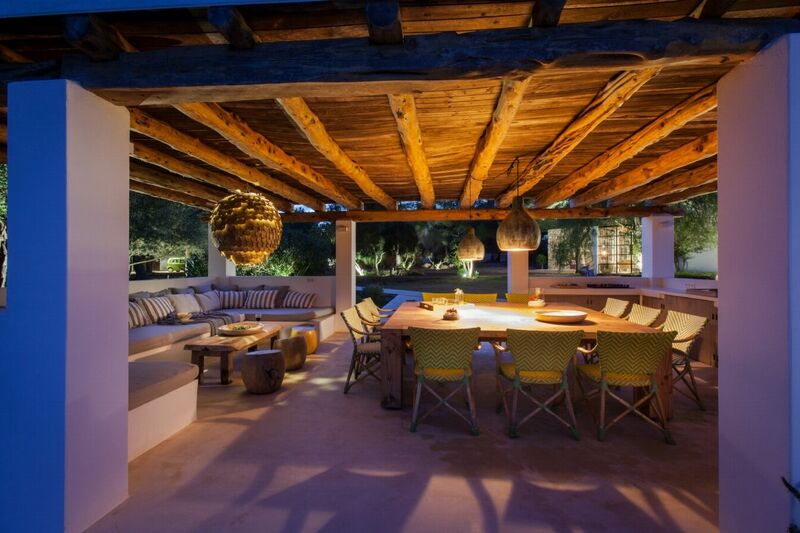 There is a Sonos sound system with 3 zones - pool area, outdoor kitchen area and indoor dining area. 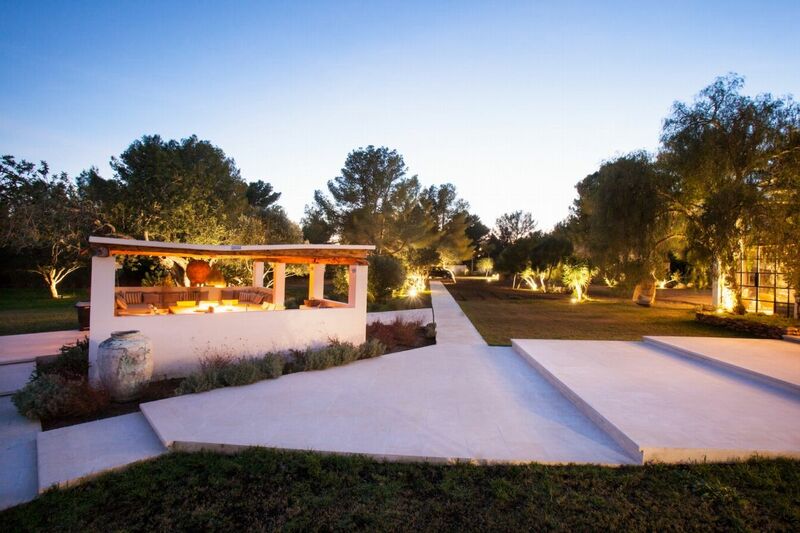 There are 2 lounge areas both with sumptuous sofas, the larger lounge has a large TV, while the other as beautiful views across the wonderful gardens. 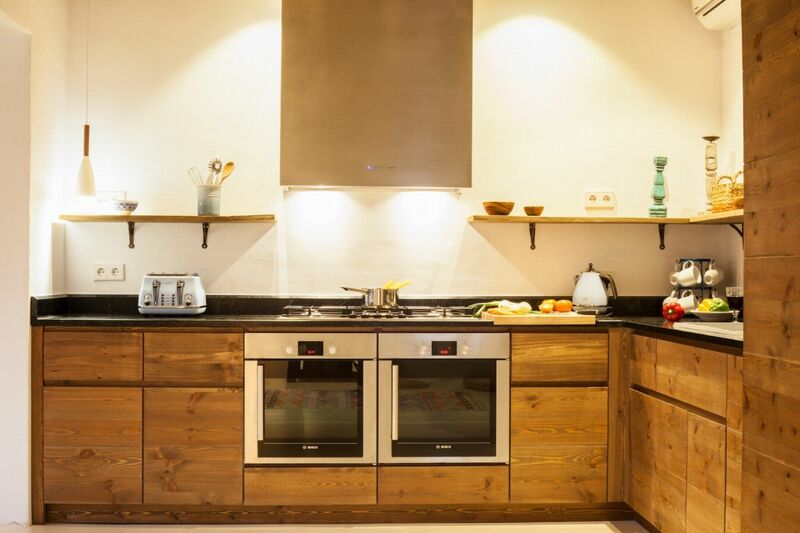 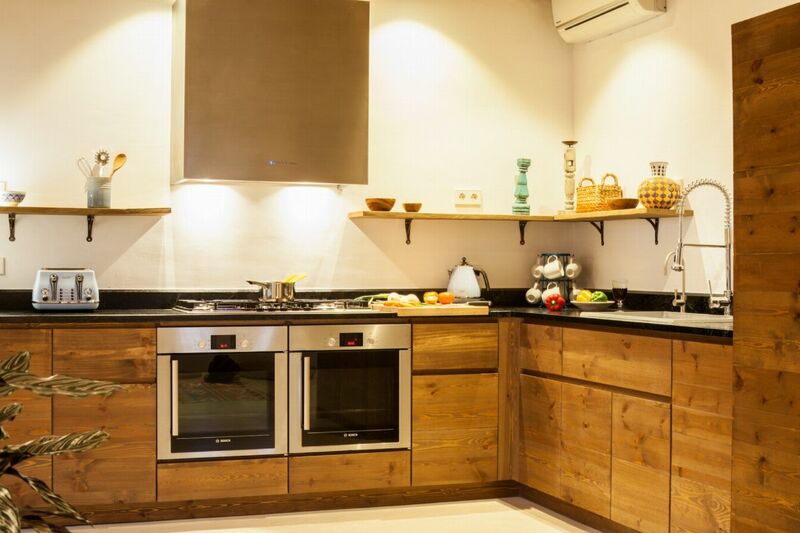 The fully equipped, beautifully styled kitchen comes with all modern appliances including a coffee machine, dishwasher, double oven, hob, microwave to mention a few. 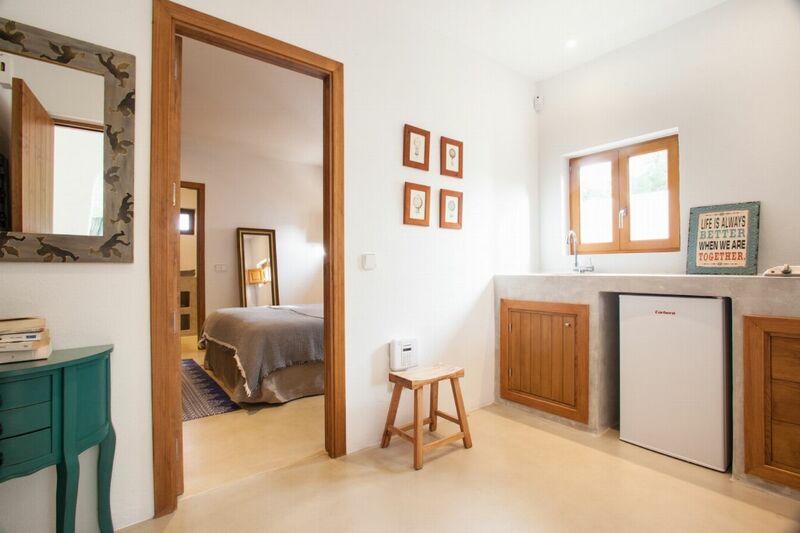 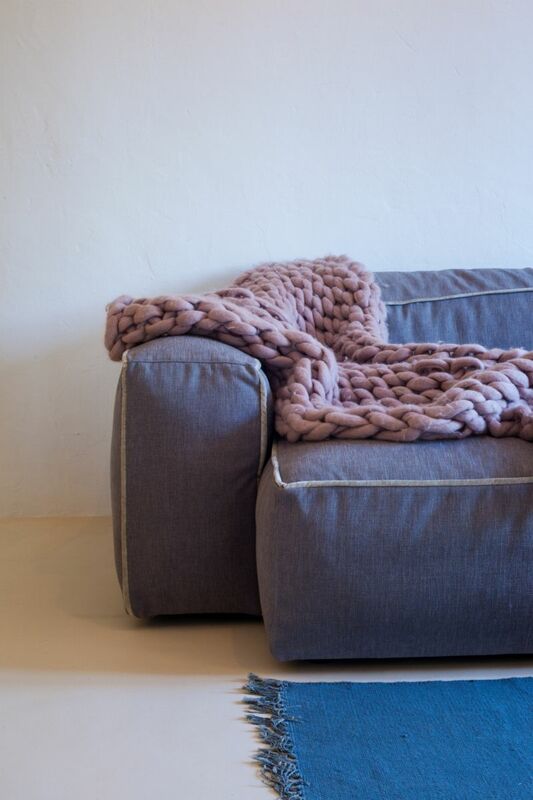 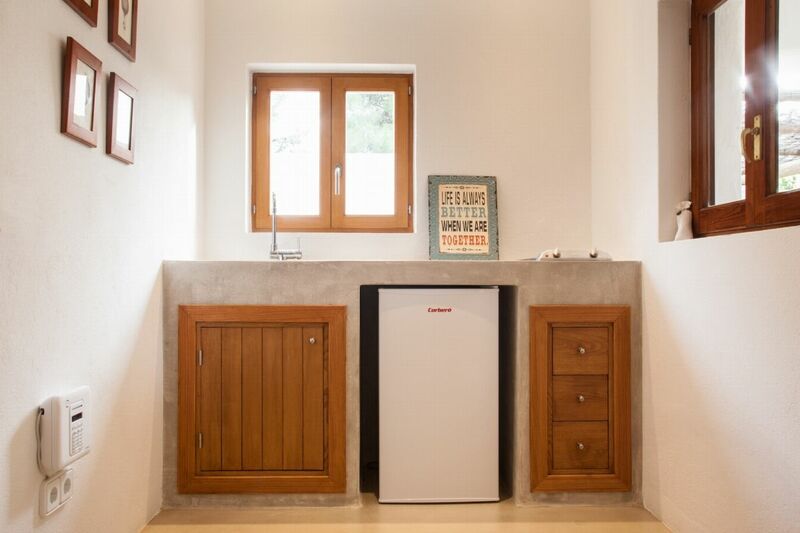 The house also benefits from a cold room and laundry room. 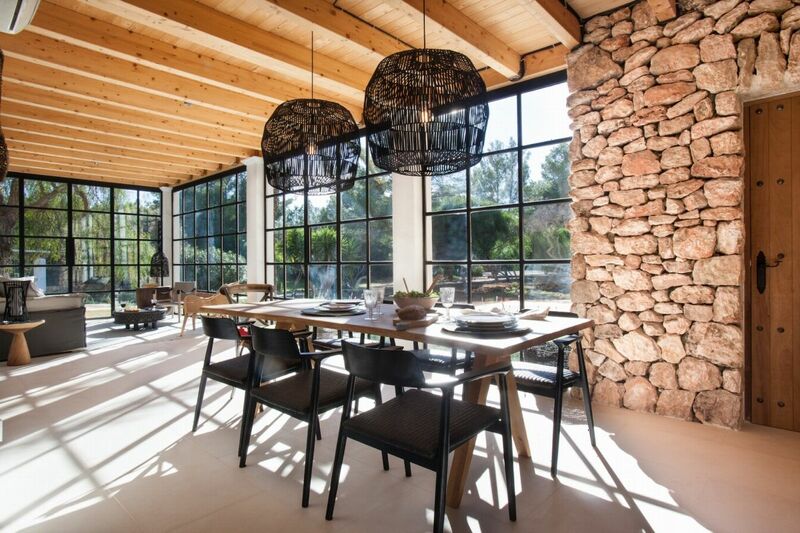 The indoor dining area easily seats 8 and also has views to the gardens. 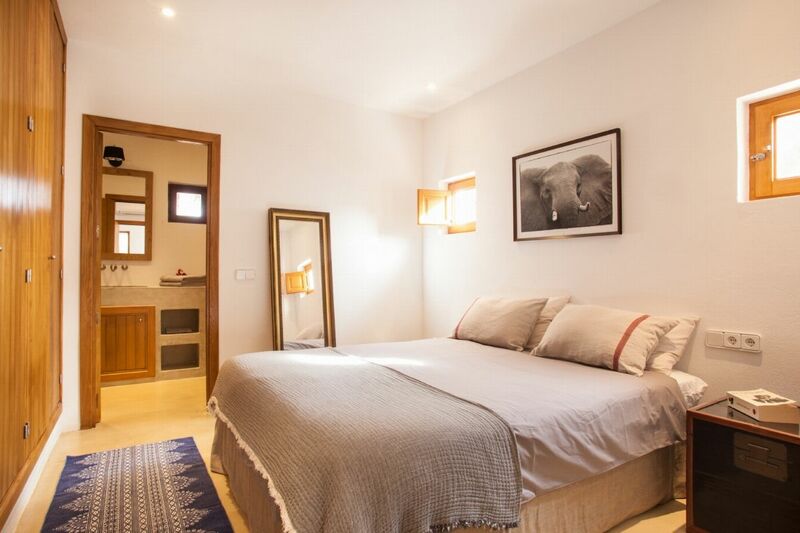 King size bed (can be altered to make 2 singles), en-suite bathroom, air conditioning, TV, wardrobes. 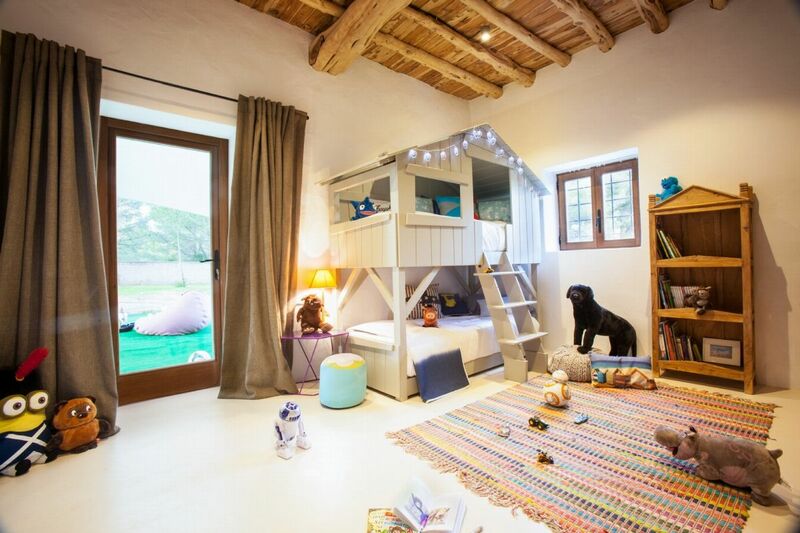 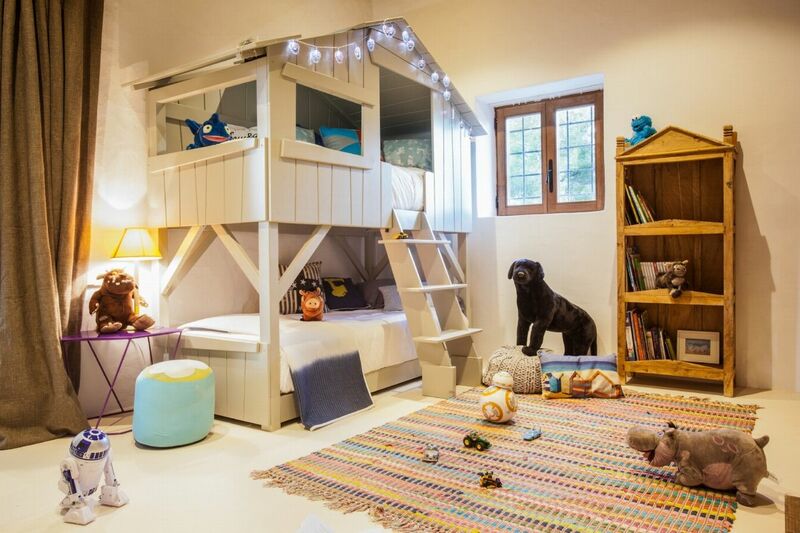 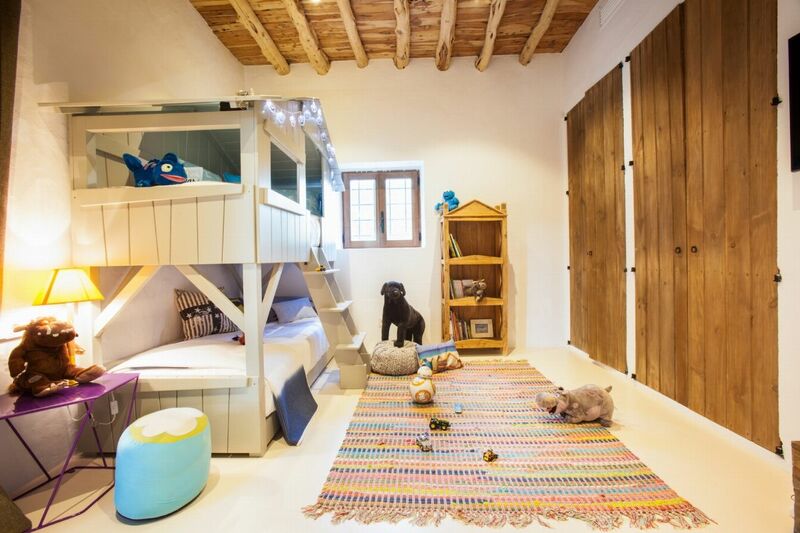 Kids room with bunk beds (can be converted into a regular bedroom with king size bed or 2 singles), en-suite bathroom, air conditioning, TV, wardrobes. 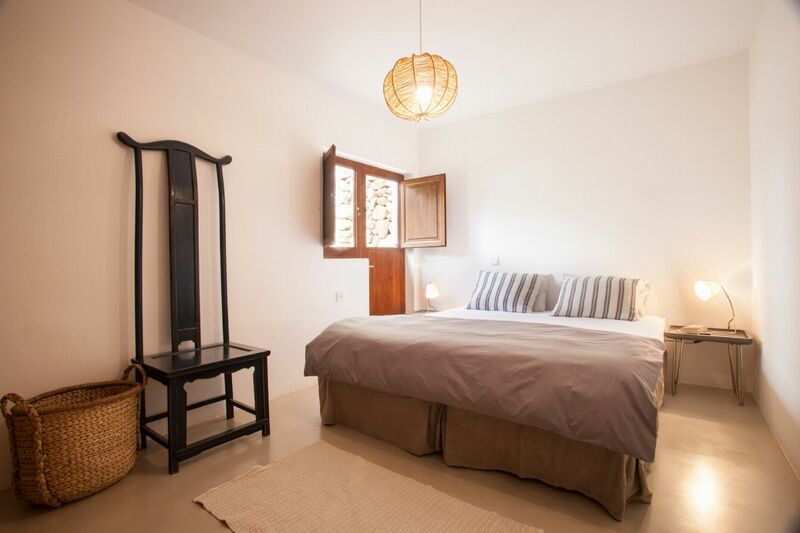 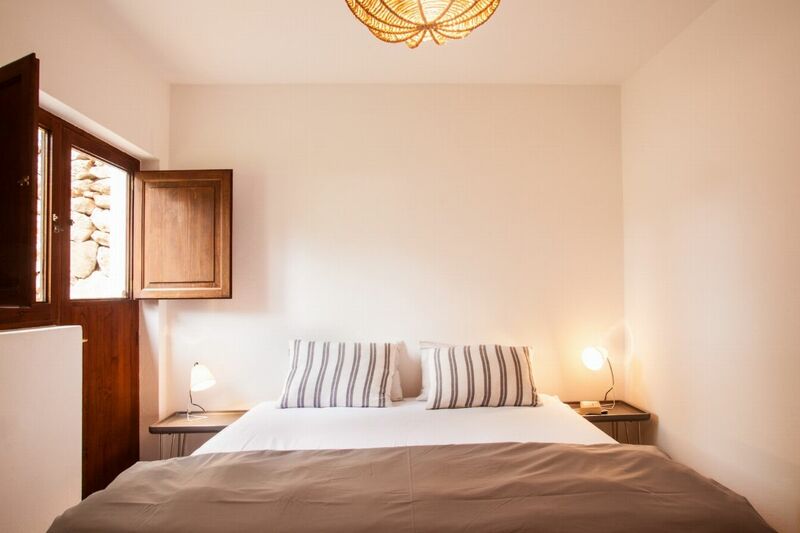 Located in the guesthouse - King size bed (can be altered to make 2 singles), en-suite bathroom, air conditioning, wardrobes. 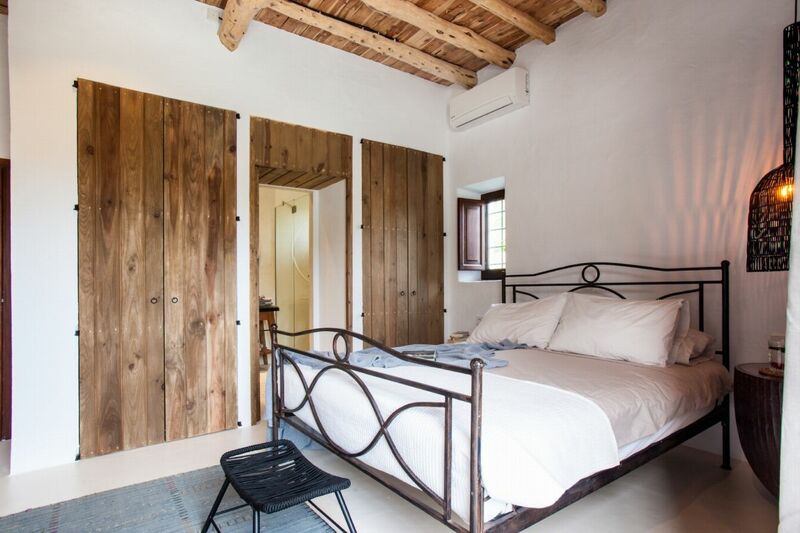 Located in the guesthouse - King size bed (can be altered to make 2 singles), air conditioning, wardrobes, shared bathroom with bedroom 8. 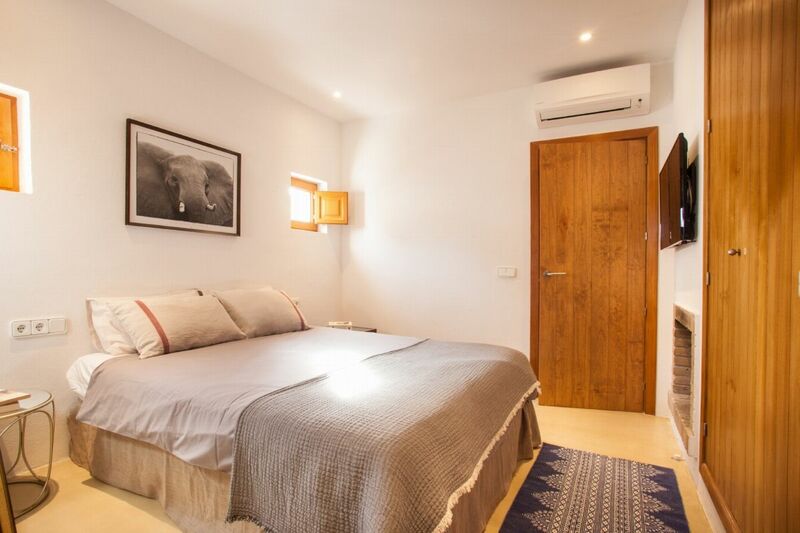 Located in the guesthouse - King size bed (can be altered to make 2 singles), air conditioning, wardrobes, shared bathroom with bedroom 7.